Cool temps and plenty of rain. That’s the kind of summer we have been having so far as we enter the middle of July. 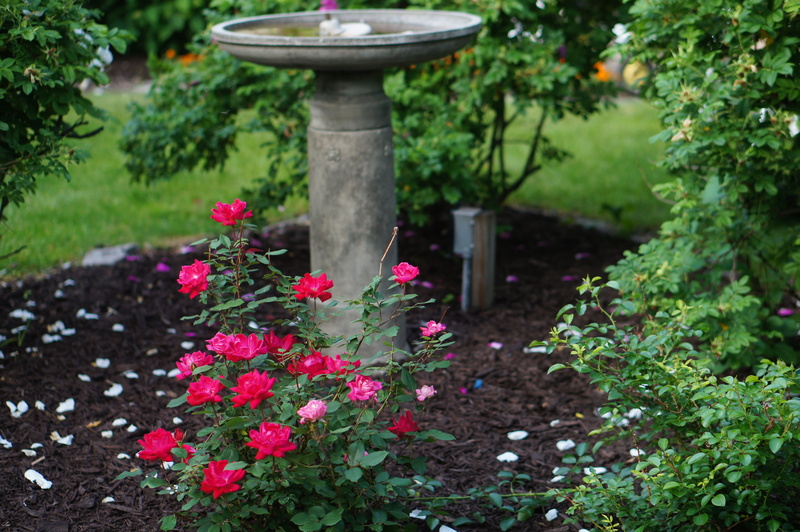 That means the gardens are green and full of blooms. 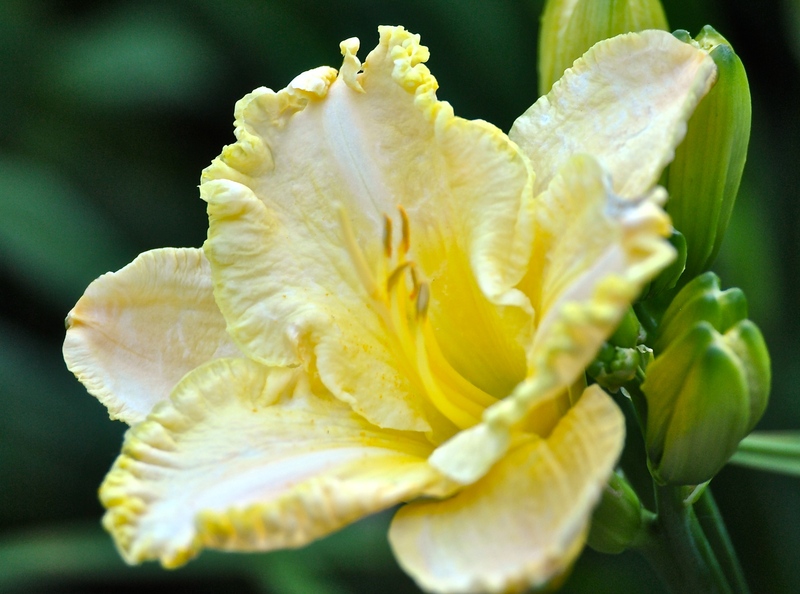 Here is what is blooming today on Garden Bloggers’ Bloom Day: July, 2014. 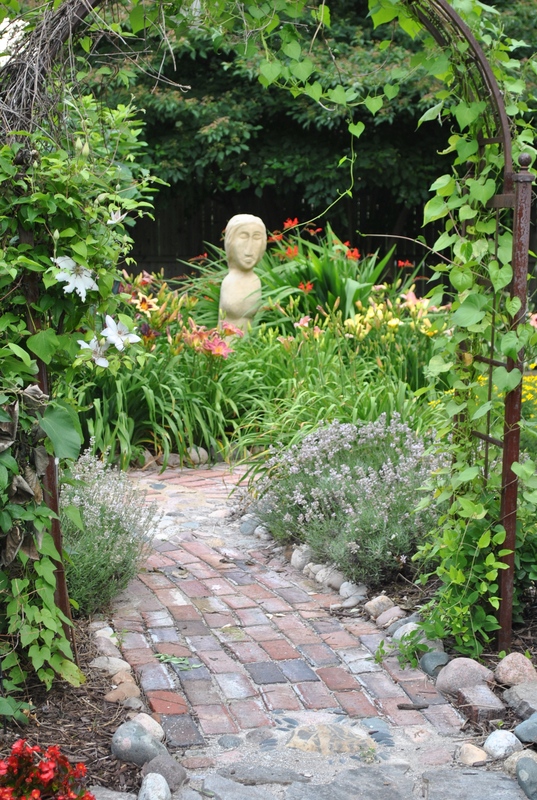 Day lilies, white clematis, Jean Davis lavender greeting everyone at the entrance to the Secret Garden. 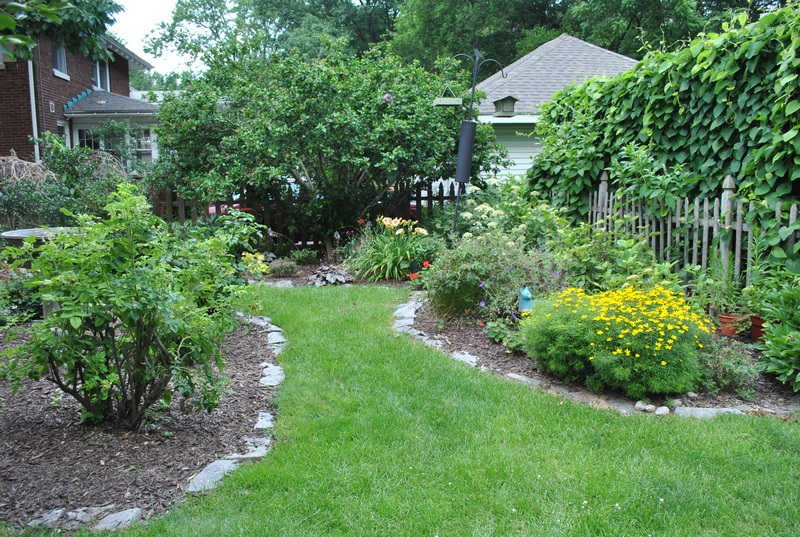 Looking east in the Secret Garden. 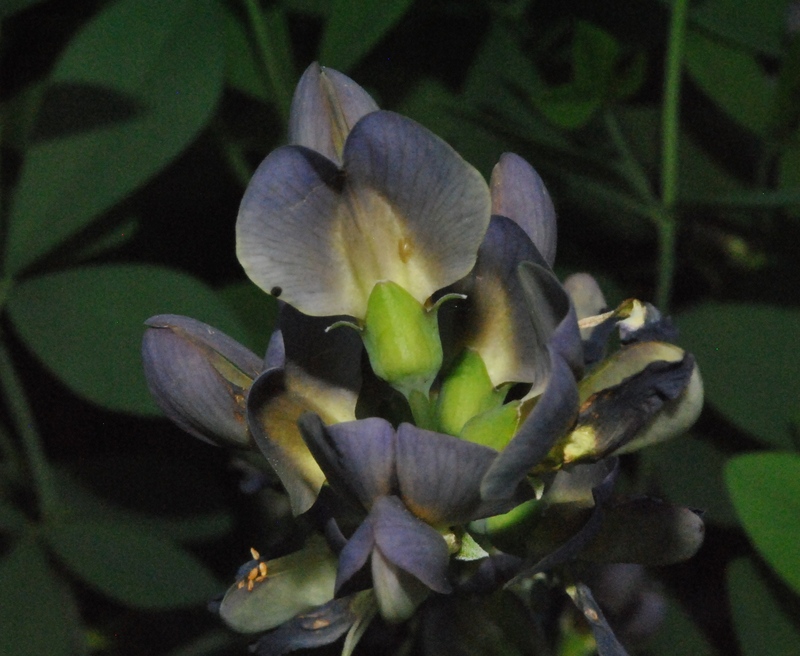 Great Expectations is blooming. 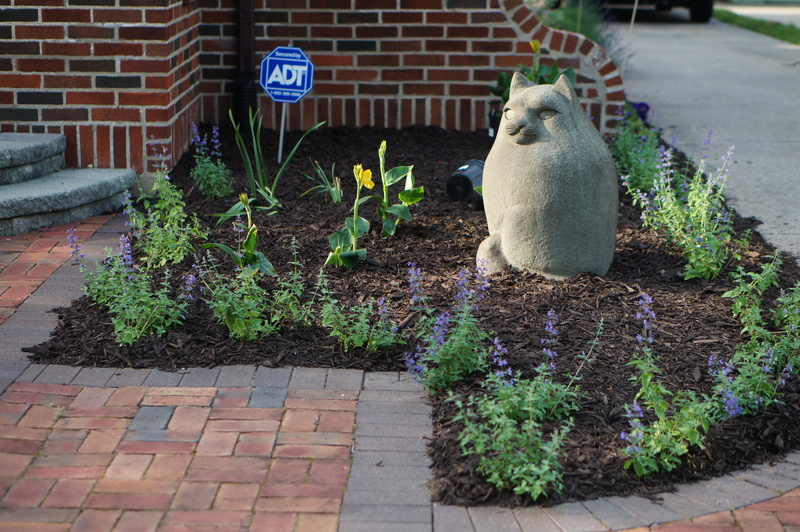 White Dome hydrangea, Rosie Returns day lily, Cool Cat catmint, various cone flowers. 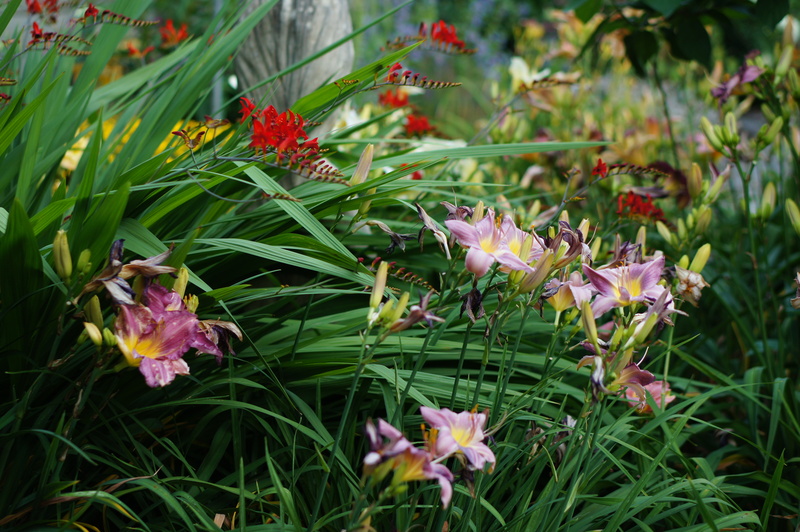 Rosie Returns day lily on the left, First Knight is the yellow lily across the path, crocosmia near the garden lady. 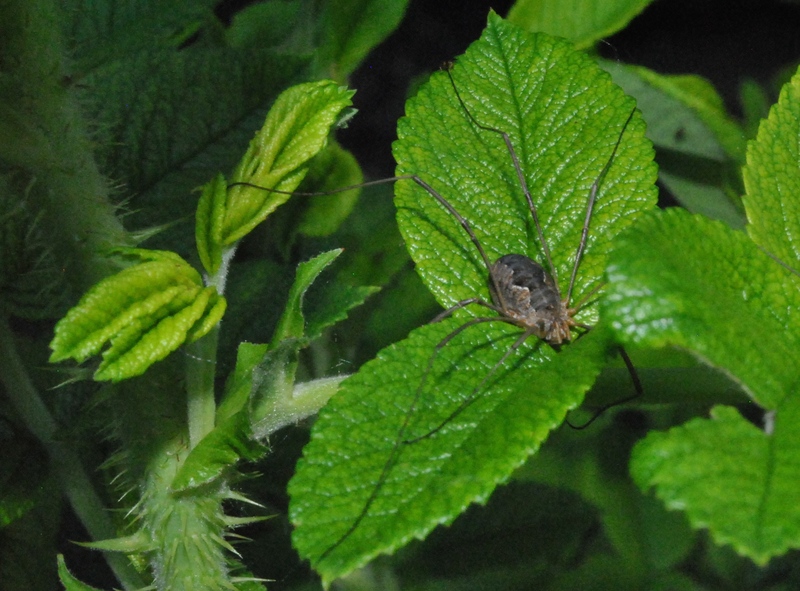 A visitor in the Secret Garden. She is welcome anytime. 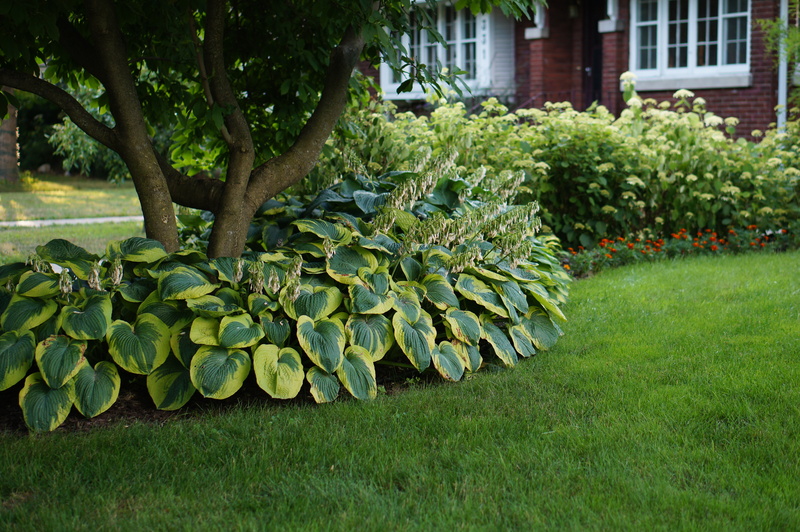 The hosta bed in the front garden under the magnolia tree. 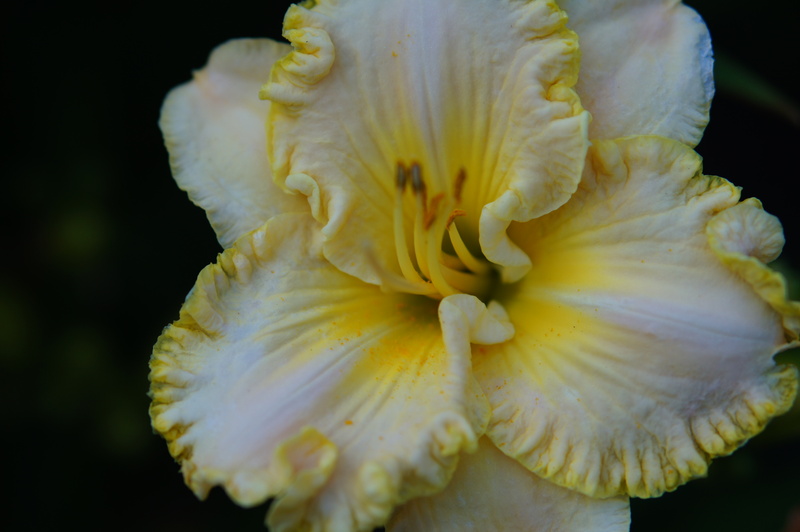 My favorite un-named day lily. 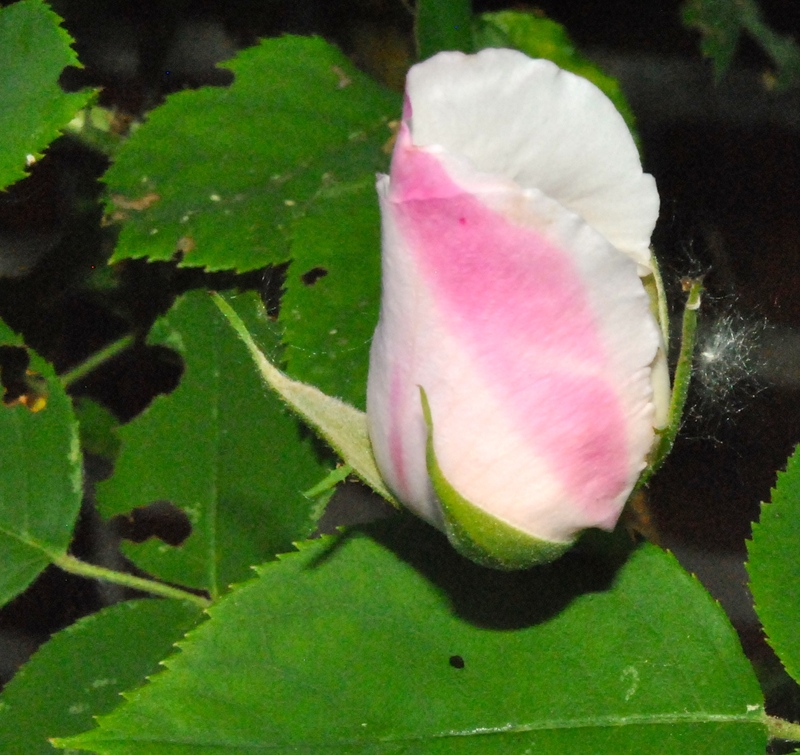 Rosie Returns also wants to go the extra mile and add an extra petal and sepal. 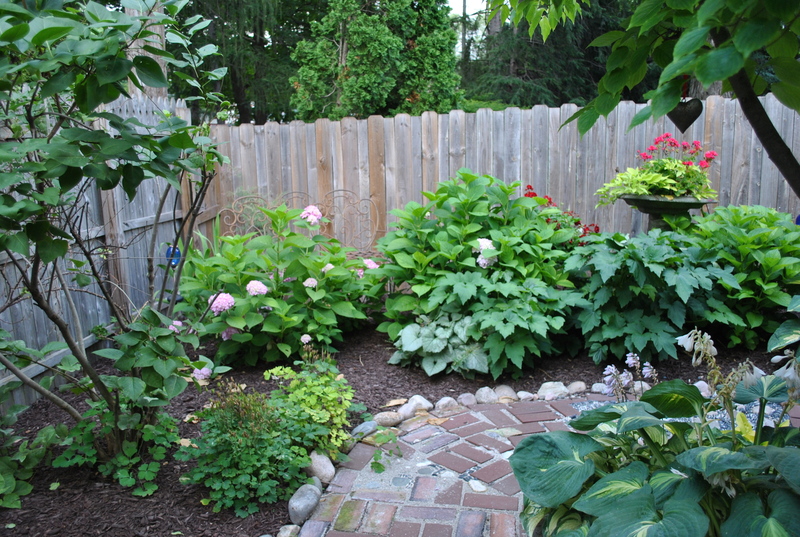 The hydrangeas are doing far better than I expected since the park removed a maple tree that gave them so much shade. 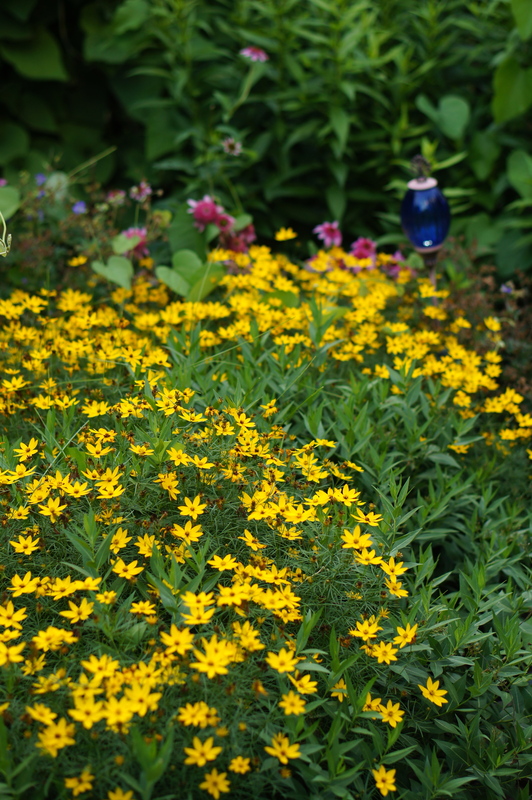 In the Lower Garden, the Zagreb Coreopsis is blooming. 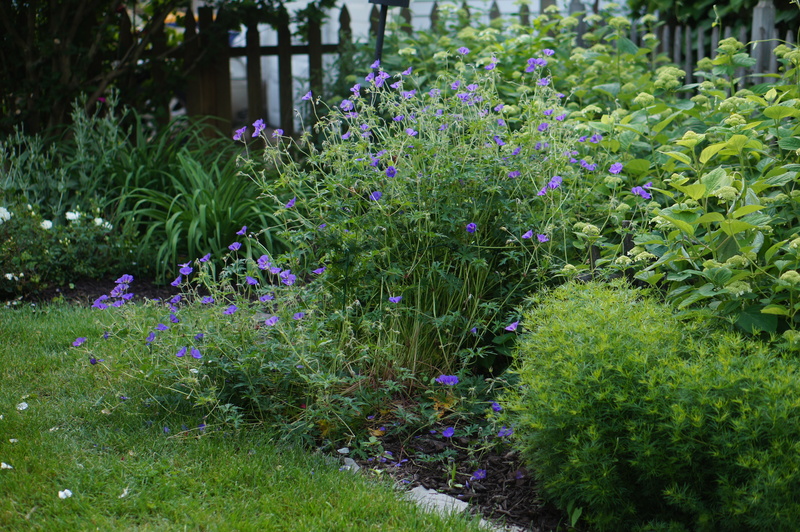 I cut back the geranium but it still has some lovely blue flowers on it. 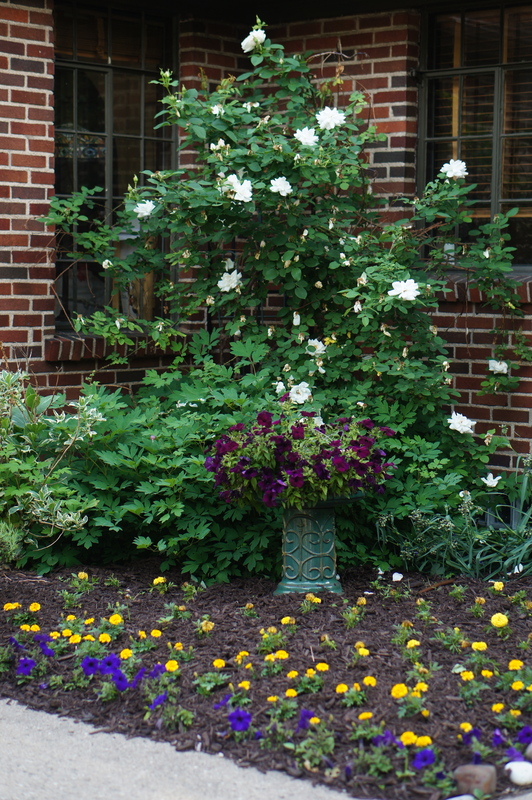 That’s Strawberry Candy under the Rose of Sharon. 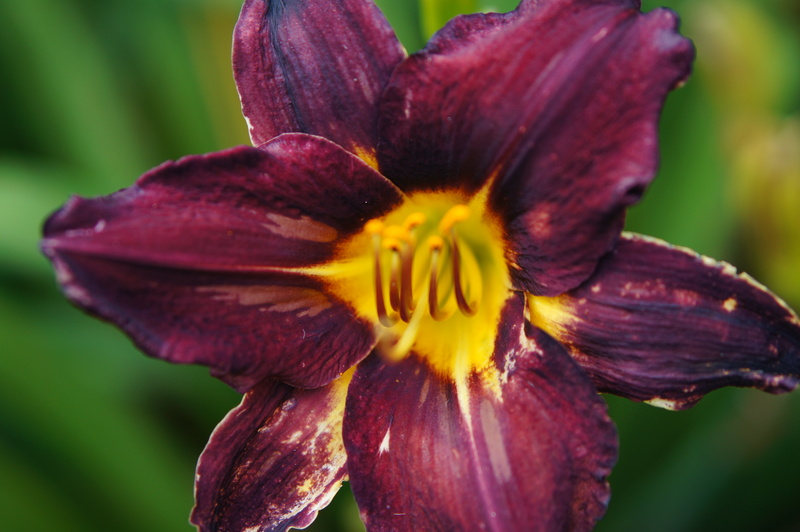 Prince of Midnight day lily. 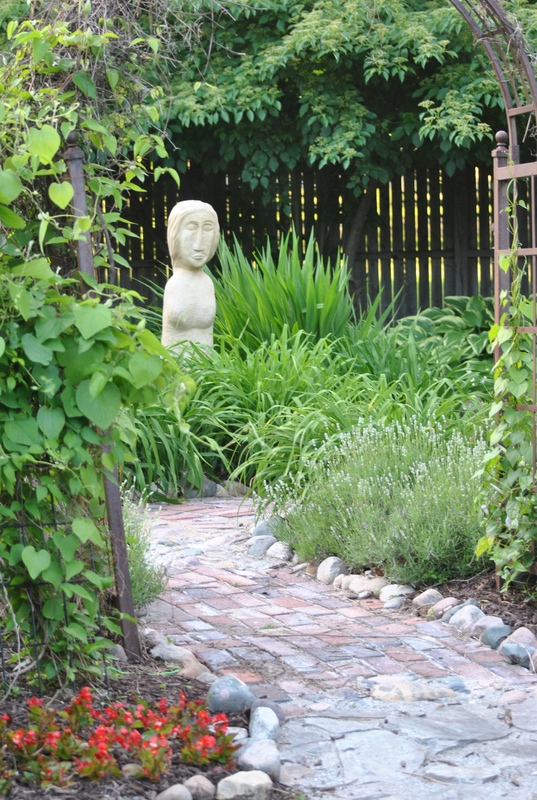 East Friesland Sage in the Secret Garden. There is a family of wrens in the bird house. 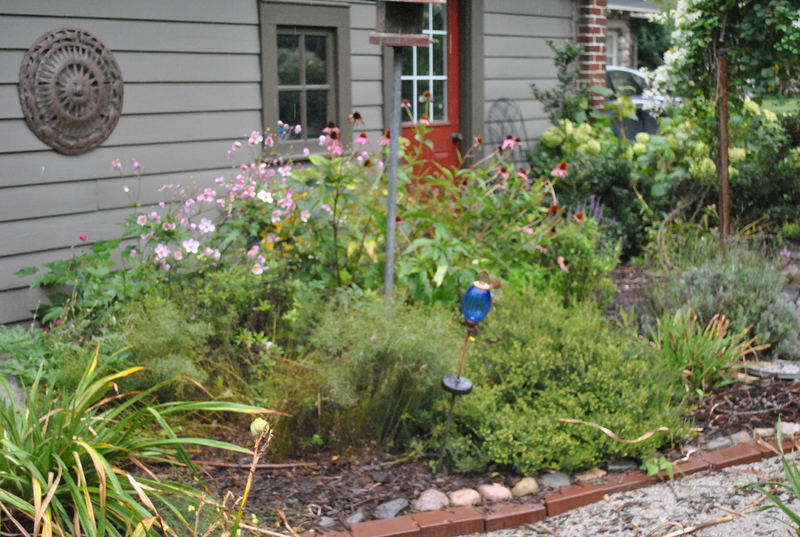 Many thanks to Carol at May Dreams Gardens for Garden Bloggers’ Bloom Day. 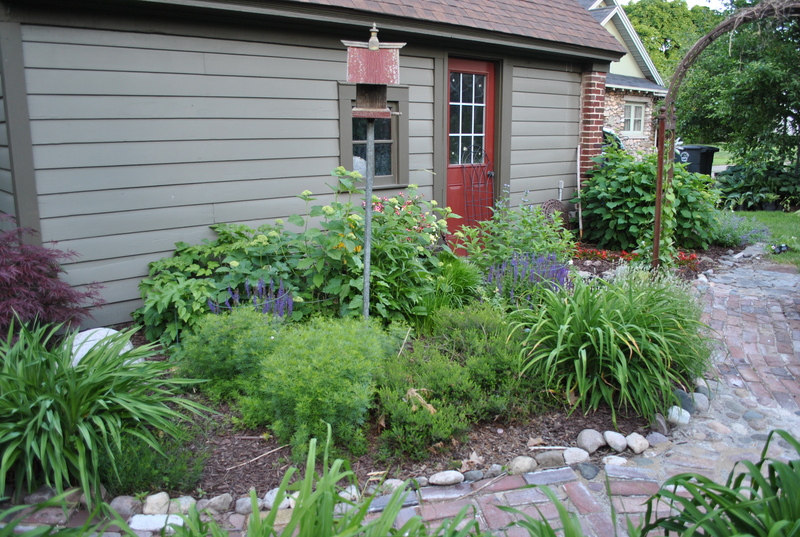 Entrance garden. 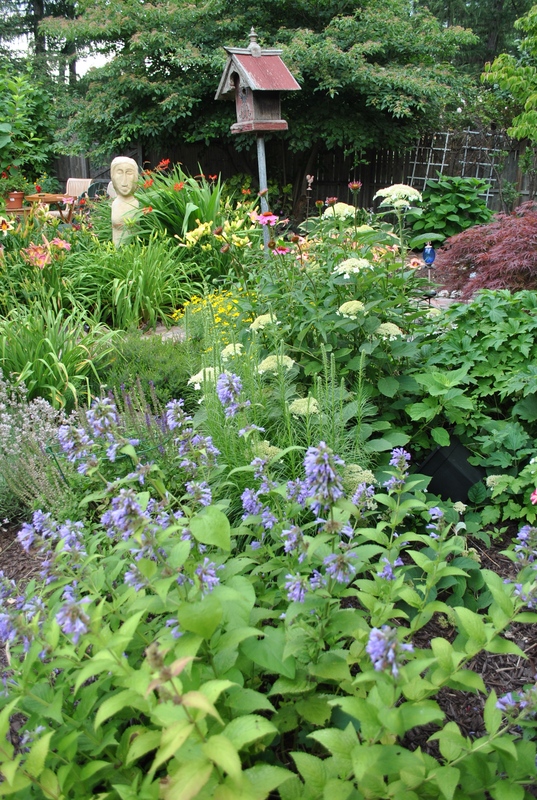 That is Walker’s Low Nepeta in the foreground. 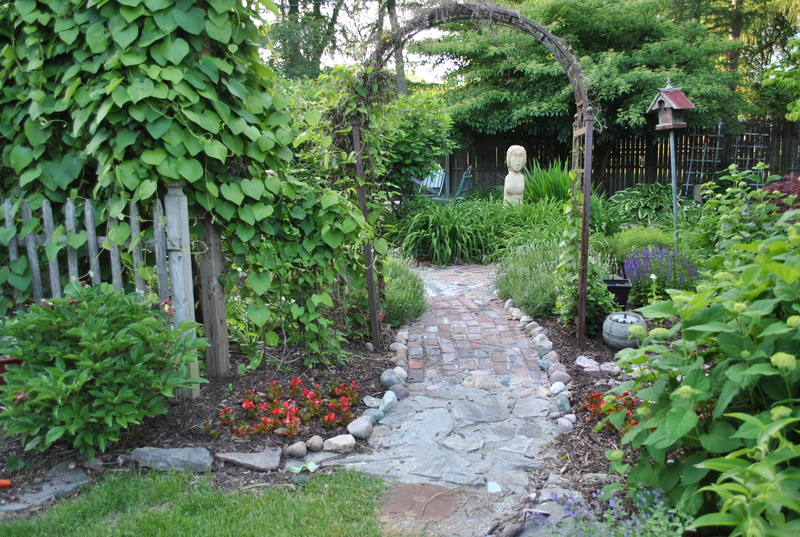 Looking east in the Secret Garden. 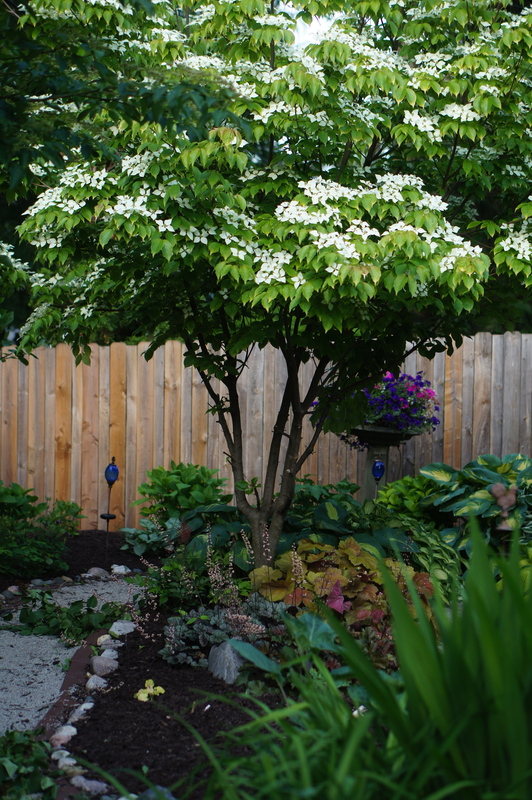 The Kousa dogwood is in bloom. 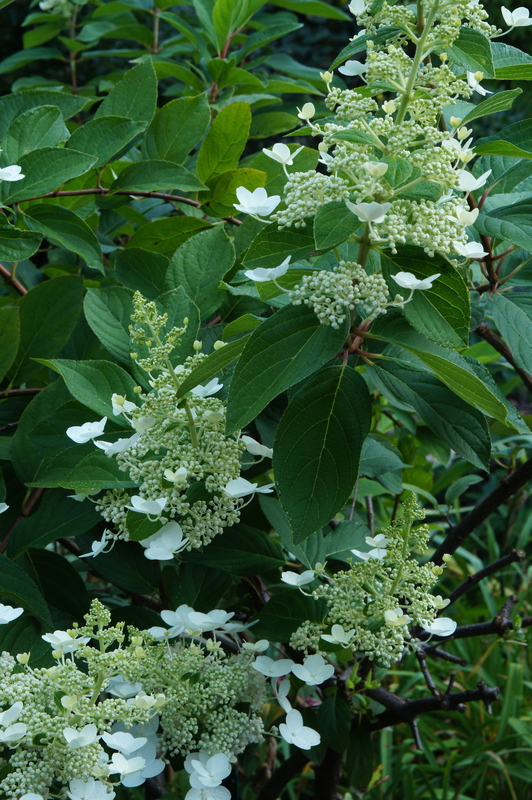 The huechera in in bloom under the dogwood. 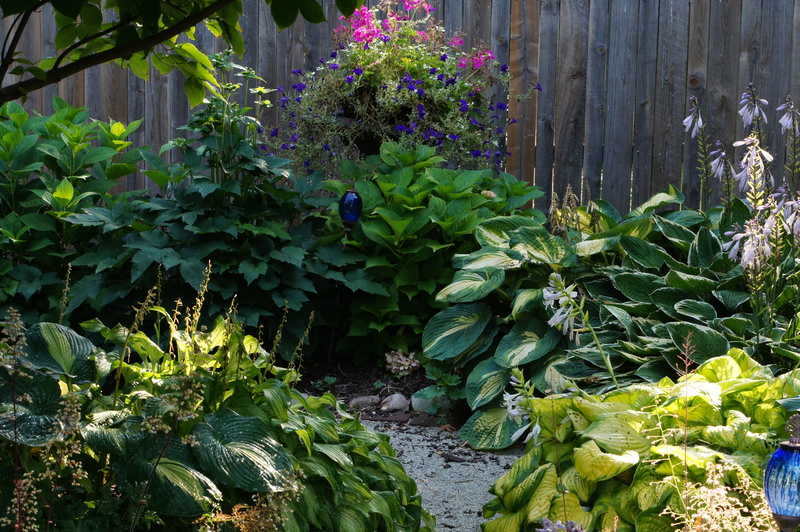 Looking into the Secret Garden. 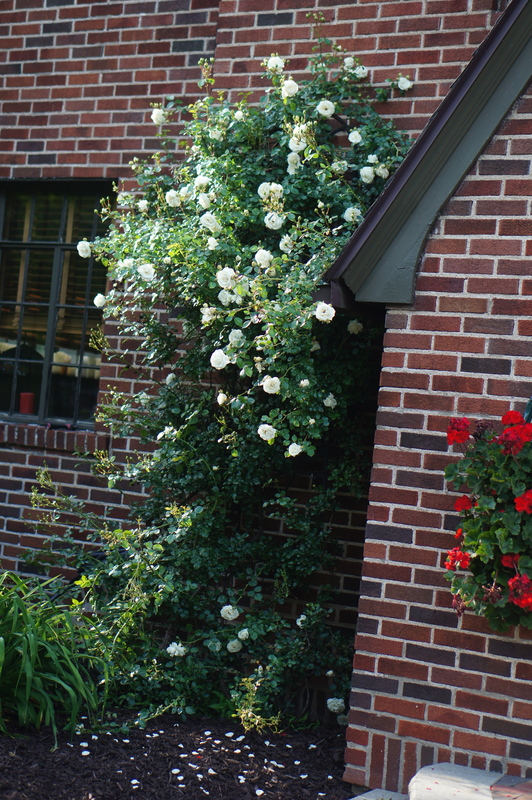 Those are red begonias at the entrance. 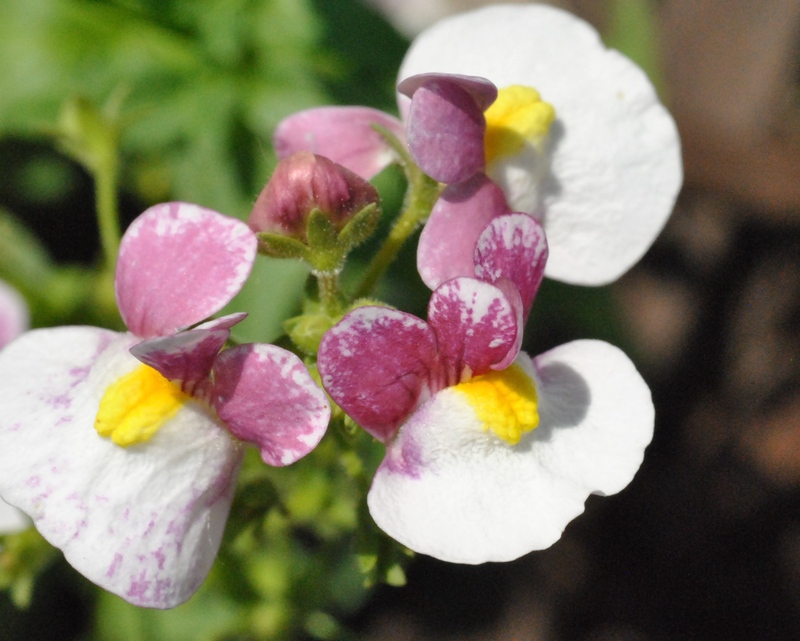 Berry White Nemesia in the corner nook. 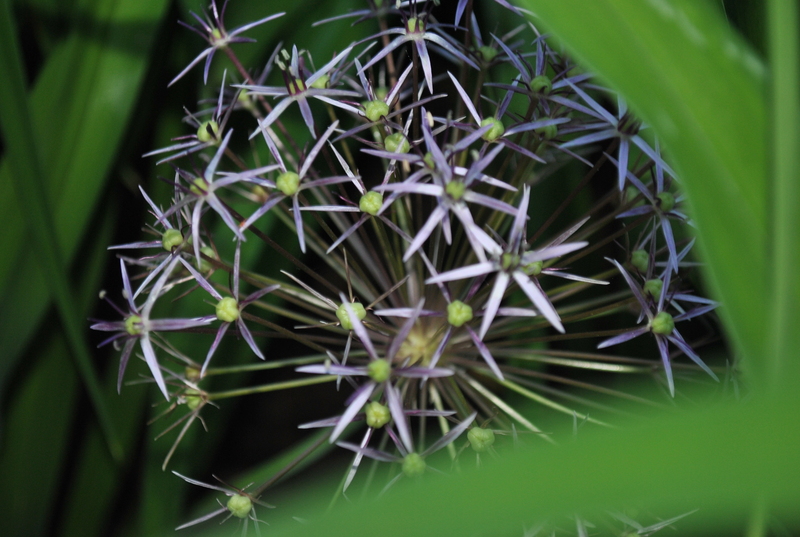 Persian Star Allium. 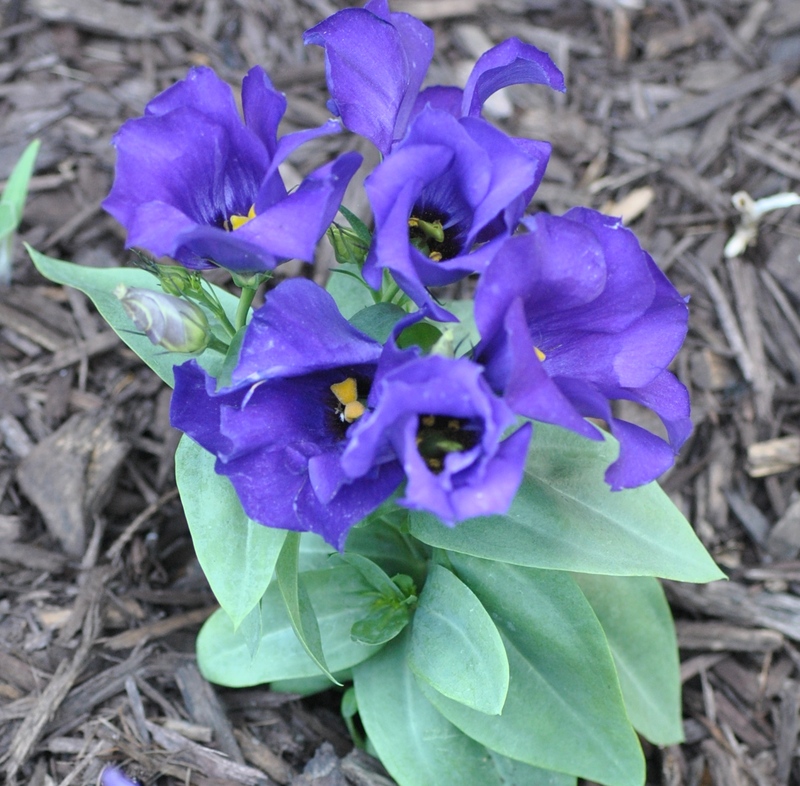 I didn’t plant this but found it in a well established day lily bed. 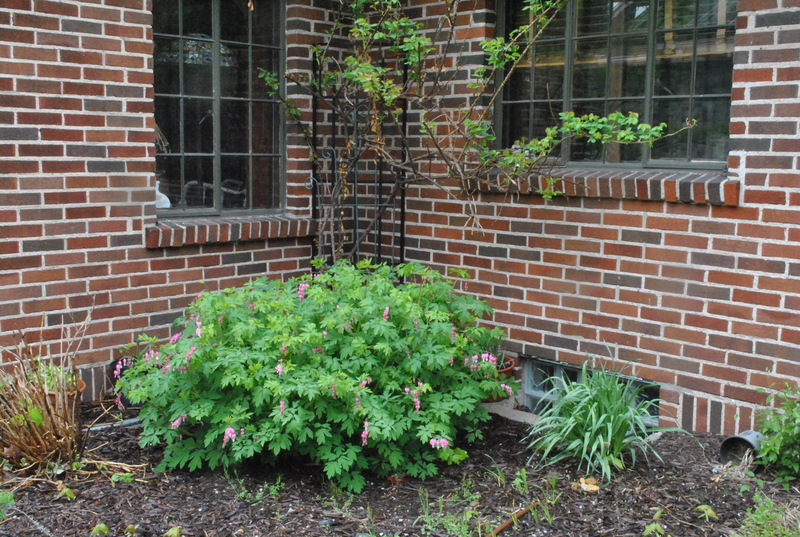 Corner nook, old white climber and bleeding heart. This is my first bloom day of the season! 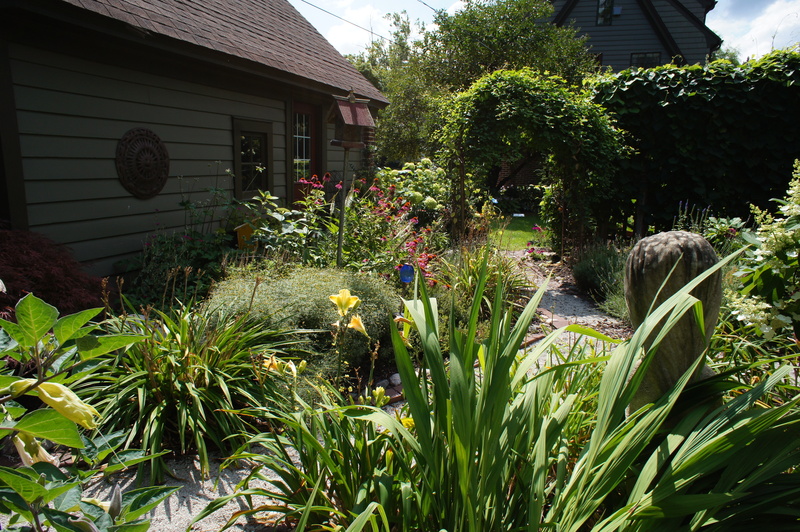 A shout out to May Dreams Gardens for starting this wonderful tradition of reporting out what is blooming in our gardens on the 15th of each month. 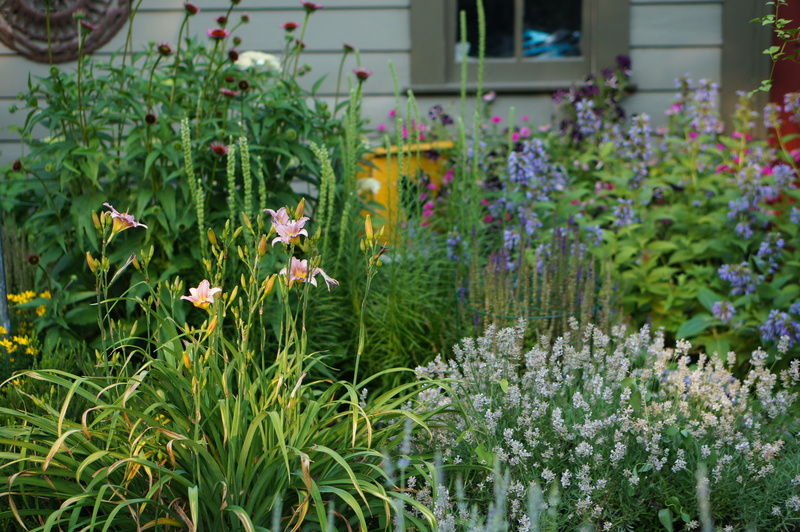 I love going to her website and following the links to gardens all over the world. 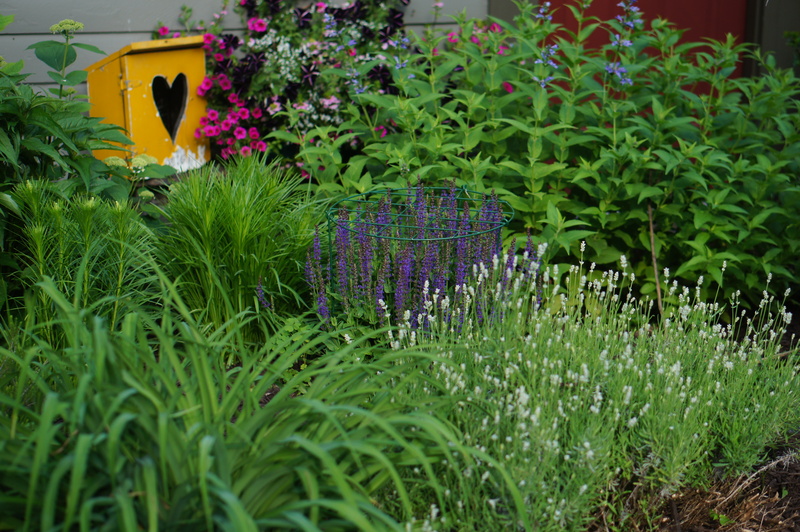 Lots of life is happening in the garden. 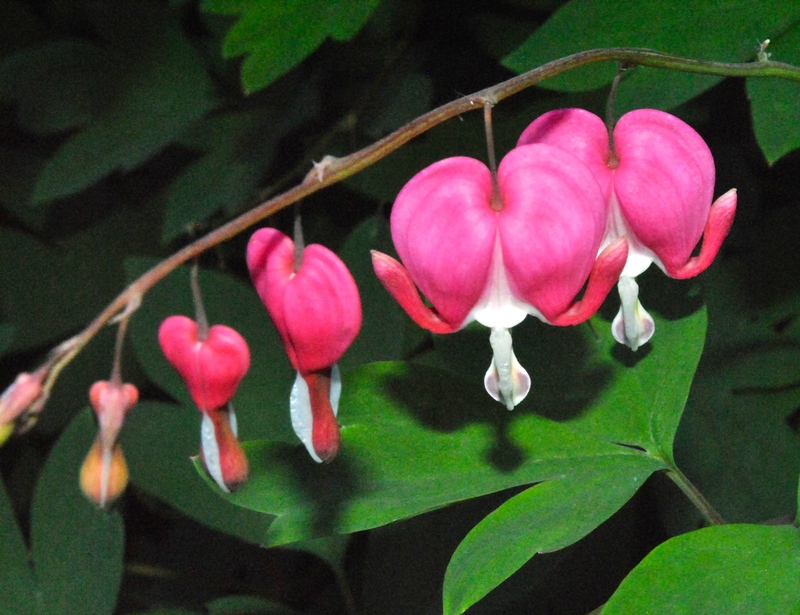 Who doesn’t get a little melty over bleeding heart. 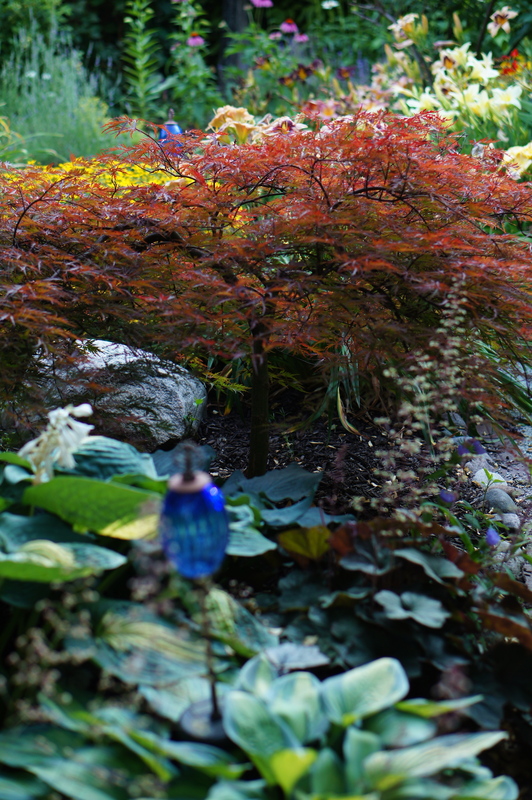 This one is celebrating life in a sheltered corner with a zillion and a half maple seedlings. 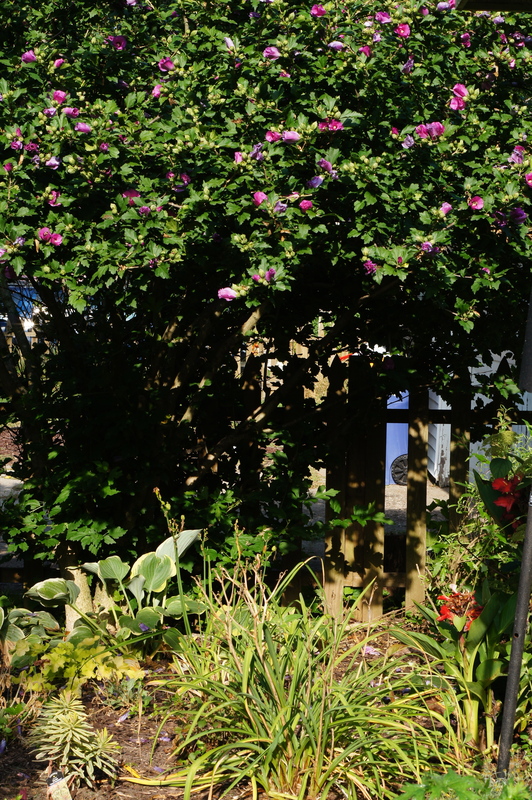 I’m a little worried about the Sweet Autumn clematis. I’m not seeing signs of life yet. 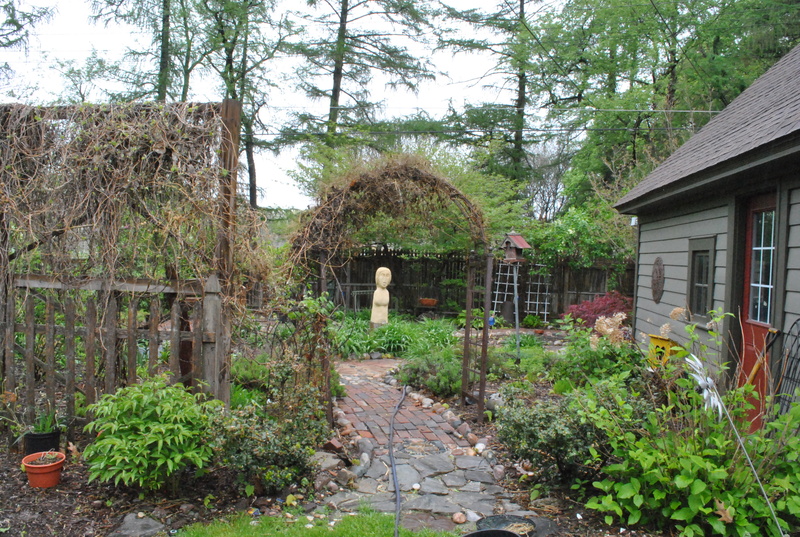 The arbor fell over during a wind storm a couple weeks ago. And, of course, we had a killer winter. I’m keeping my fingers crossed. The pink heather has been blooming for several weeks. 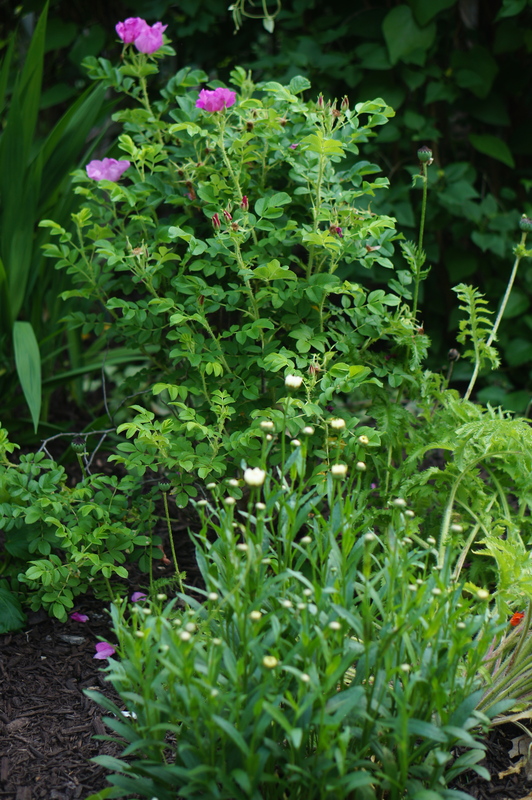 This bed always looks a bit scraggly until the bark goes in and the later blooming plants fill in. 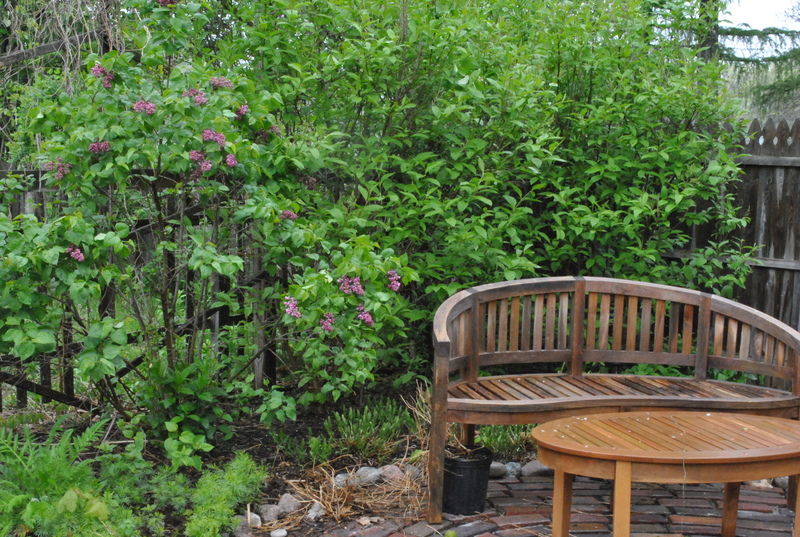 Lilacs along the north wall of the Secret Garden. 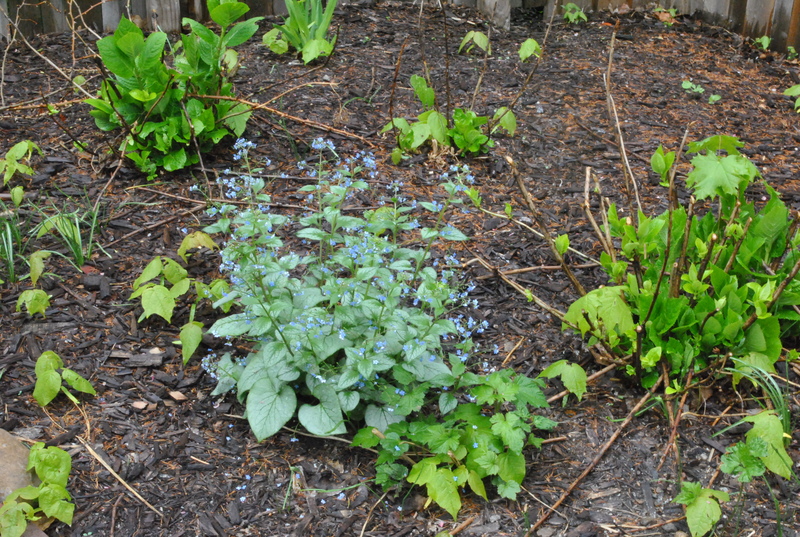 Jack Frost Brunnera blooming all by itself in the Secret Garden. 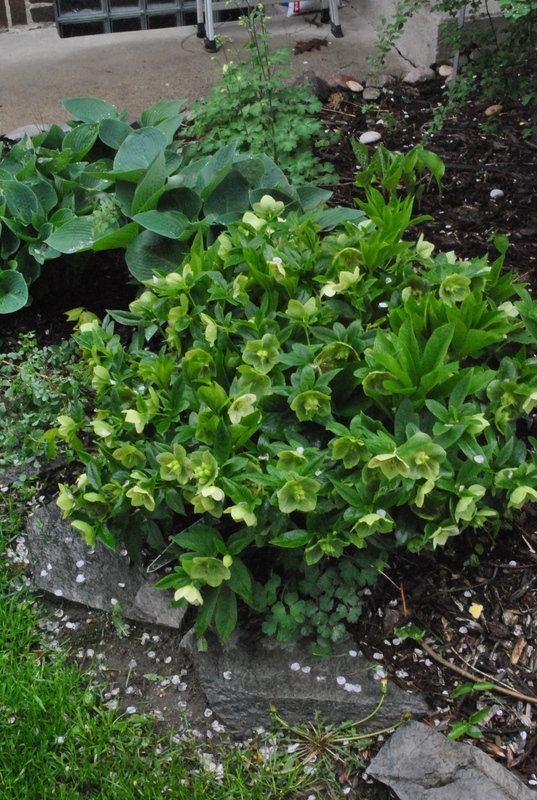 Hellebore near the back door. 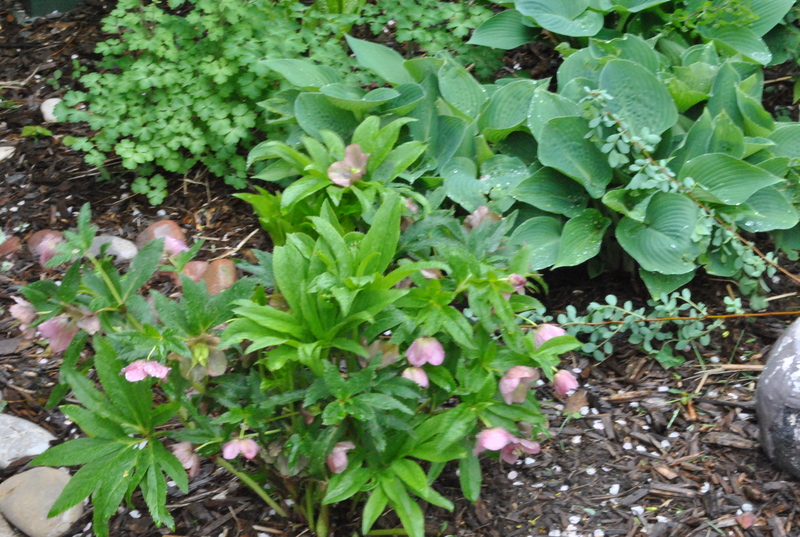 Lovely deep pink hellebore that a friend gave me. 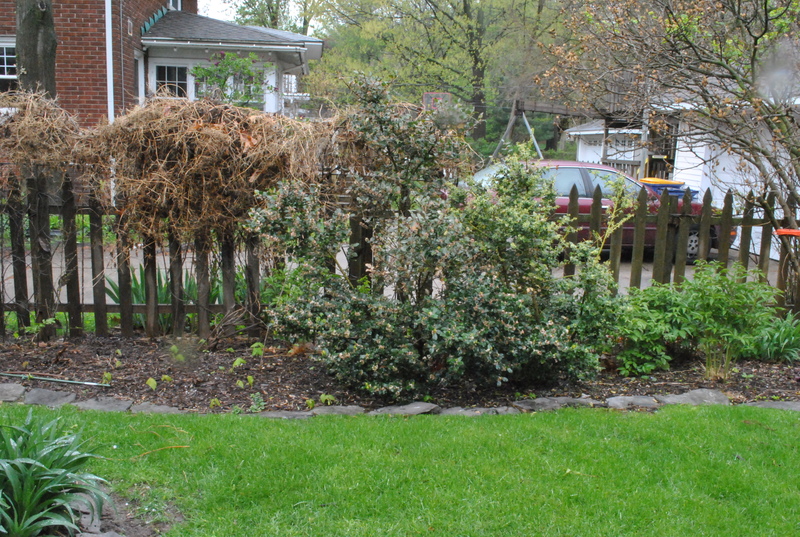 I’ve actually yanked out one large holly bush, and two more will be going to a good home, perhaps this weekend. But I’m keeping this guy. 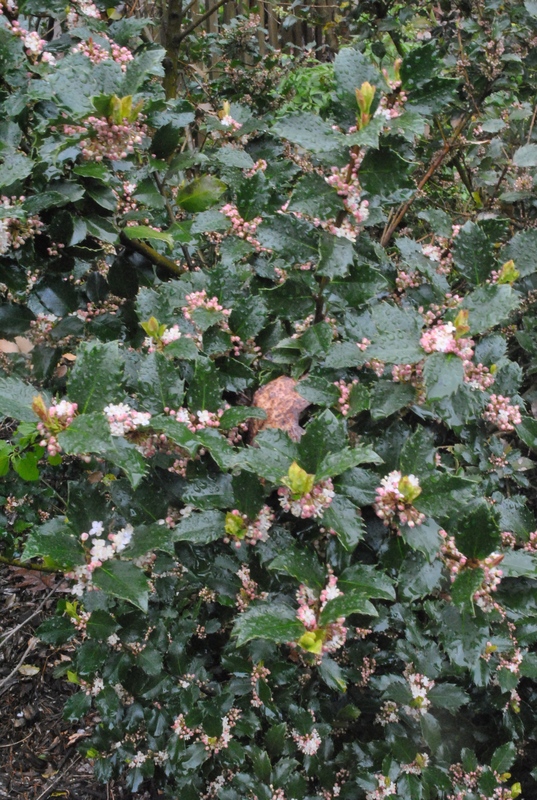 Another shot of the holly that will be staying. 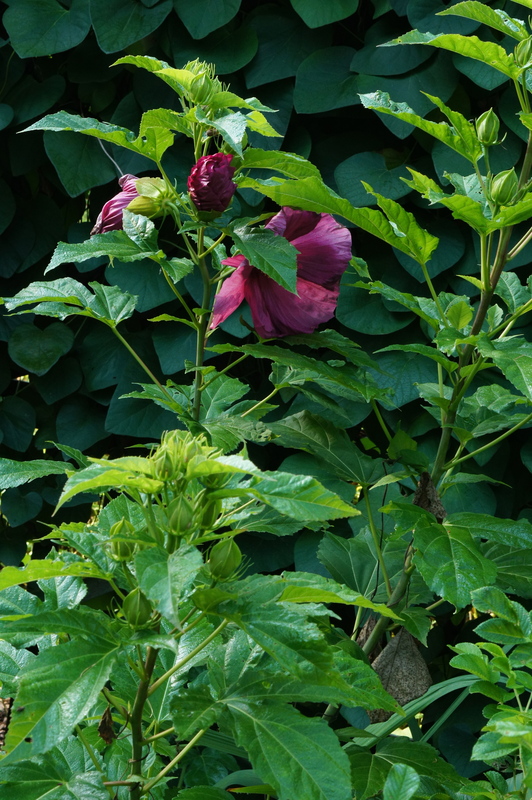 Next to it is another Sweet Autumn clematis that I’m hoping is just sleeping. 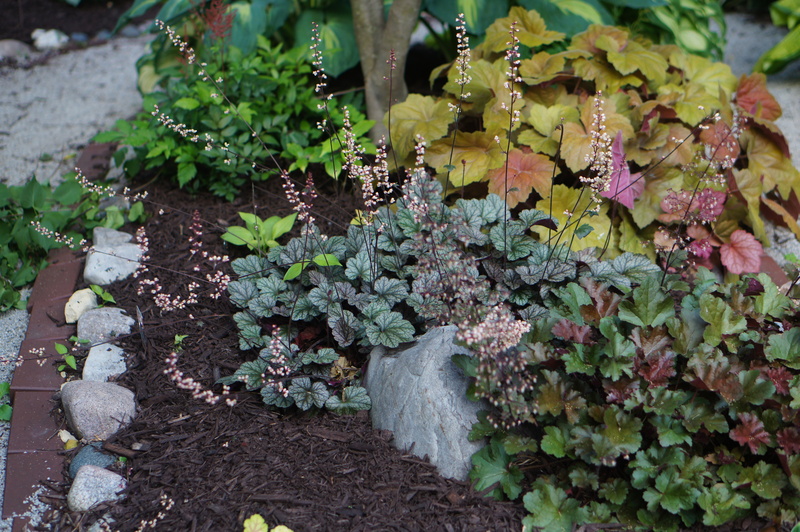 The Foamy Bells have won the heuchera race. 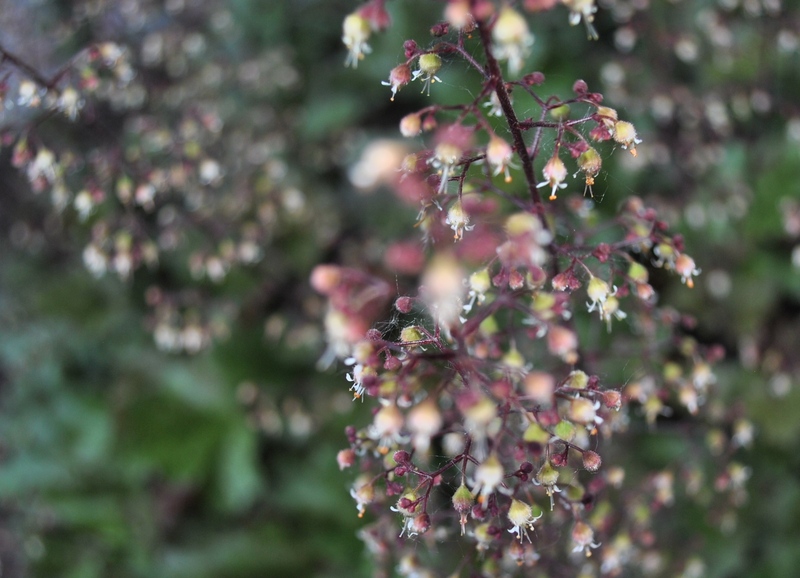 Actually, Foamy Bells are Heucherella, a cross between heuchera and tiarella. 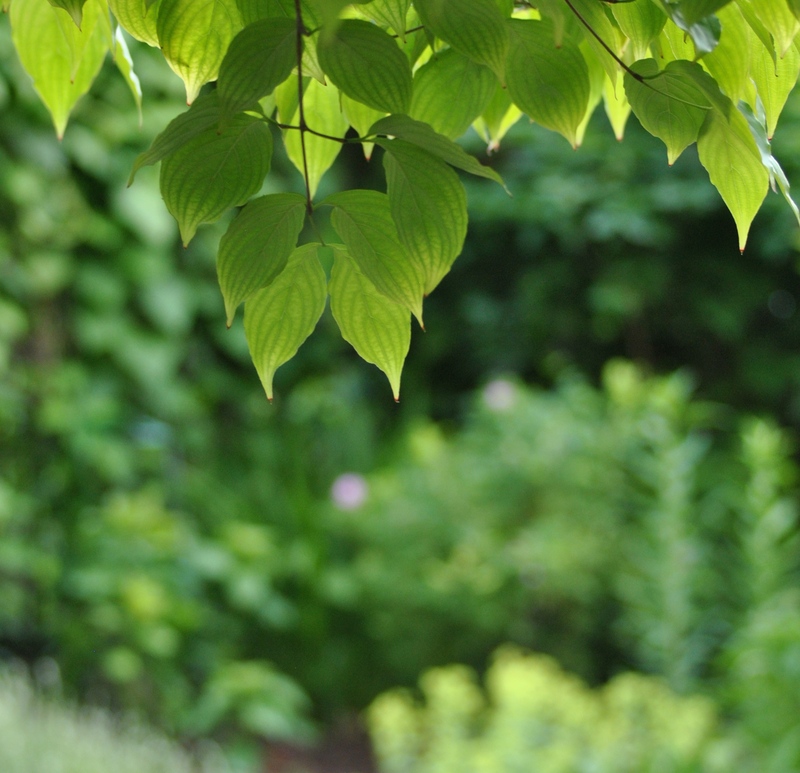 And, yes, those little bits of green are more maple saplings. 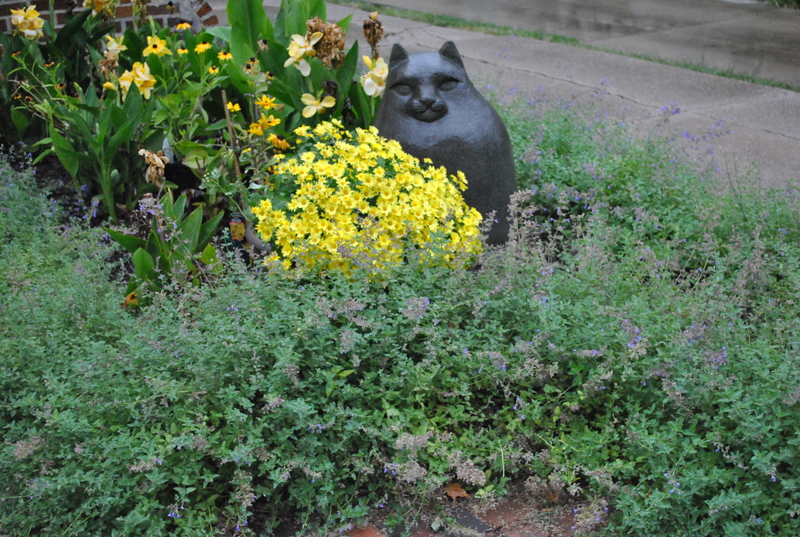 Walker’s Low catmint isn’t blooming yet, but it really, really wants to. 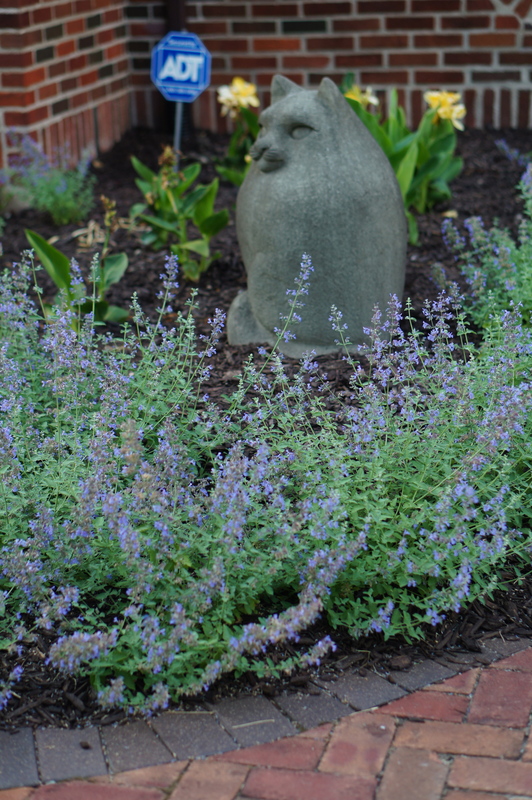 I’m so in love with this catmint that I think I’m going to plant more of it in the Secret Garden. 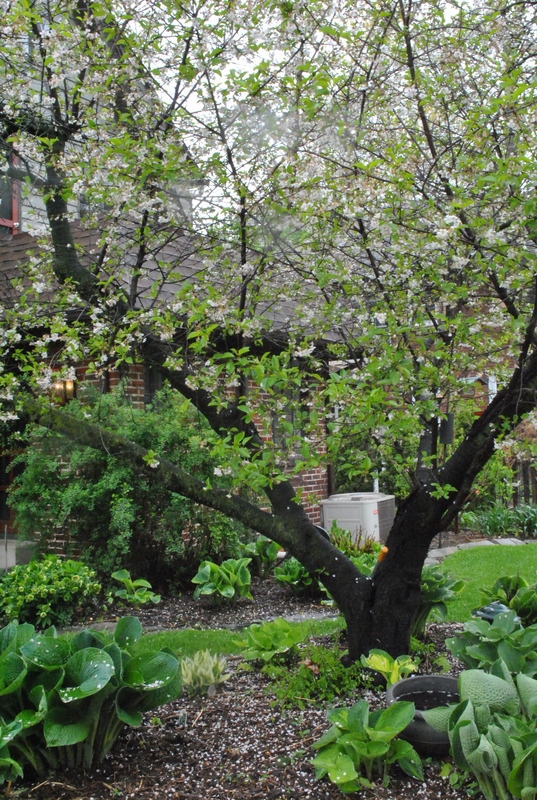 The old cherry tree in the lower garden is starting to let its petals fall. 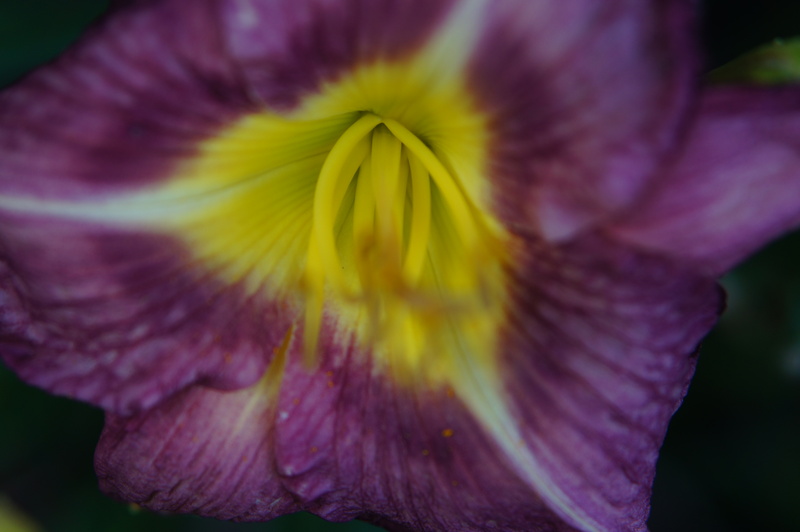 Each spring I try and stand underneath it so that a few petals will fall on me. The old magnolia in the front garden is just about finished with its blooms. 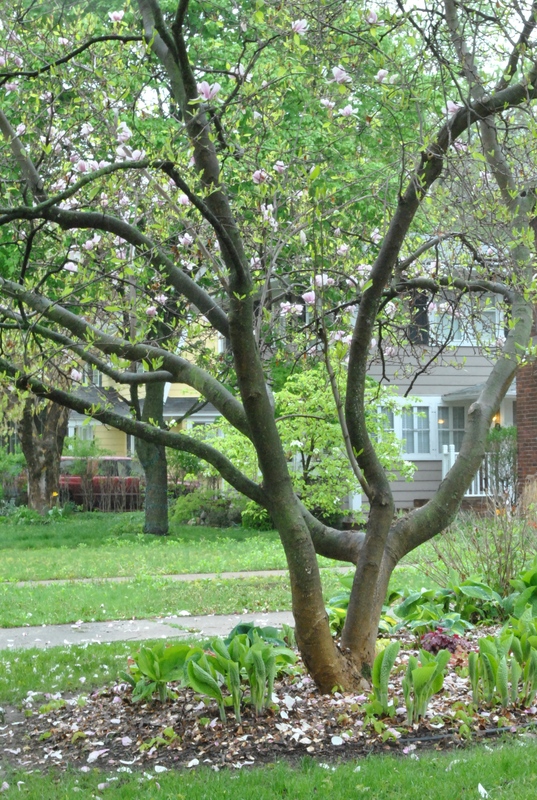 Our rain has knocked a lot of the flowers to the ground, but this tree is beautiful in all seasons. 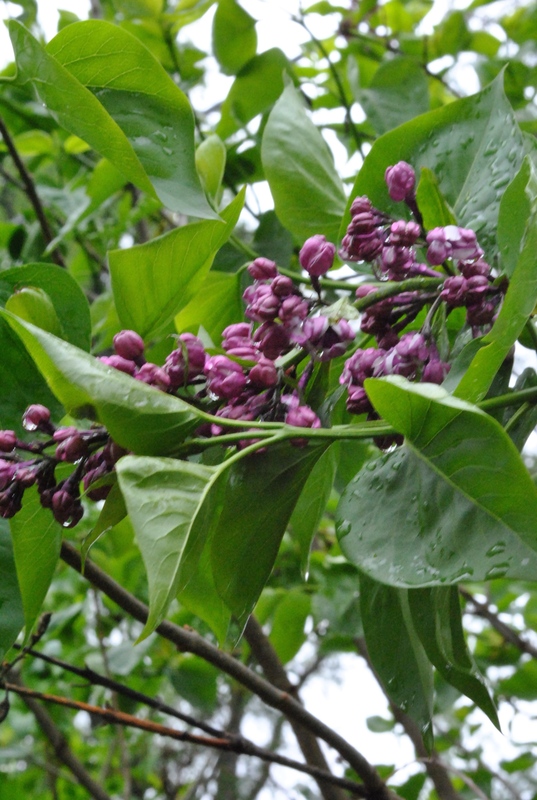 Sensational lilac along the north wall of the Secret Garden. 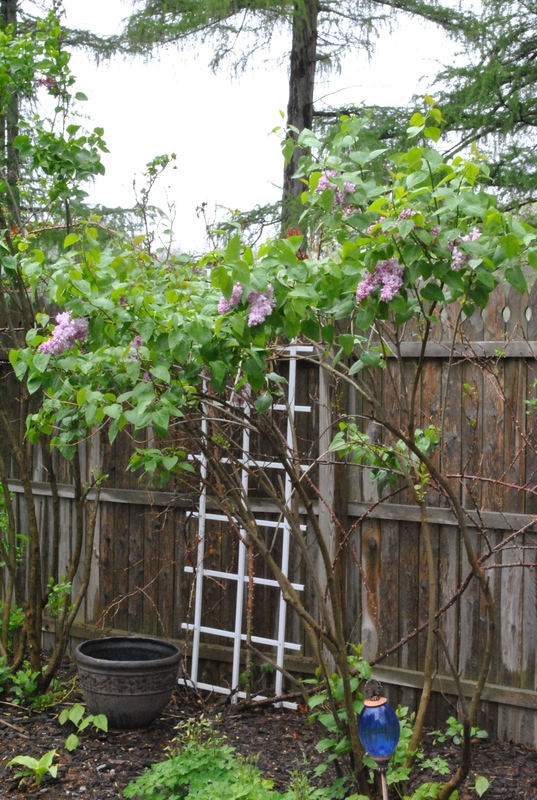 LOVE this lilac, but I need to give it hard prune as soon as it stops blooming. 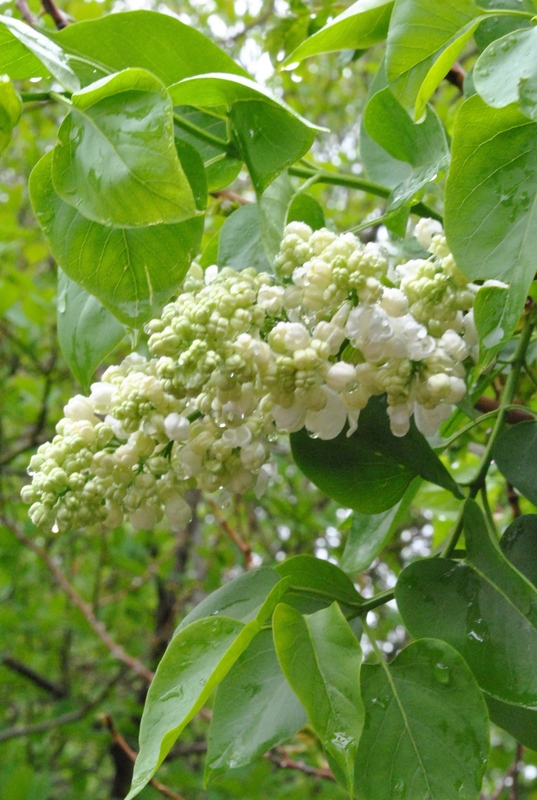 Madame Lemoine lilac along the north wall of the Secret Garden. 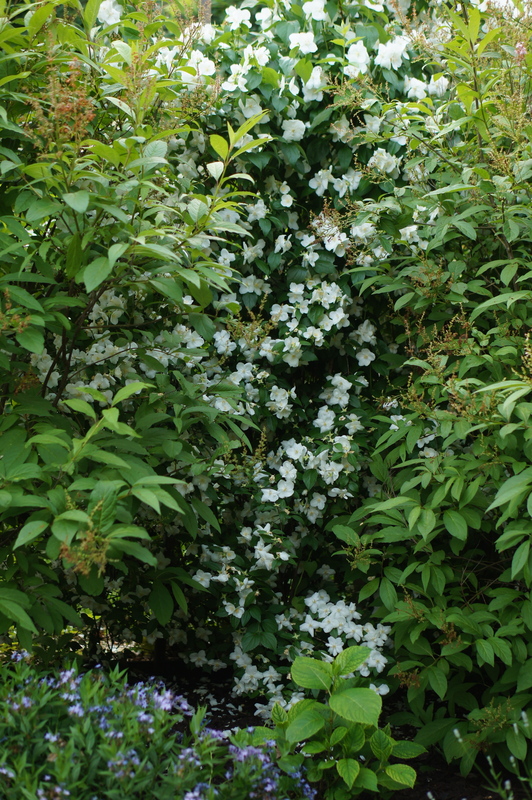 Belle de Nancy lilac in the Secret Garden. 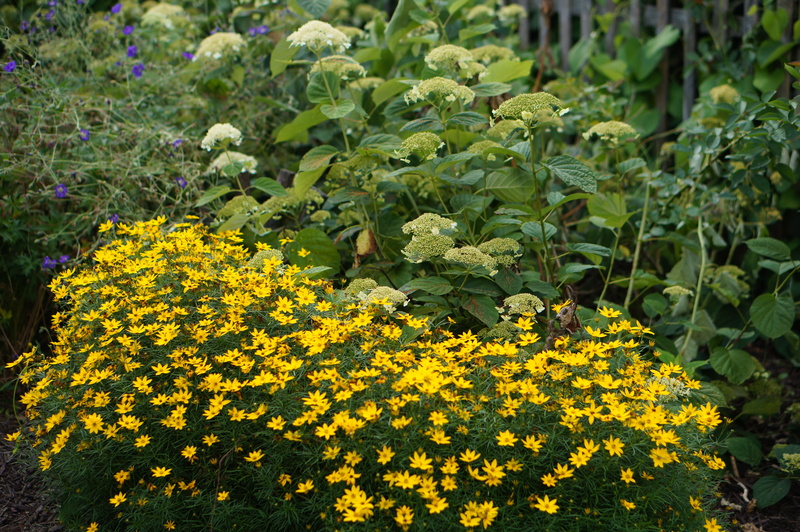 Autumn is turning here in West Michigan, but on this rainy cold Bloom Day, the gardens are still kicking. 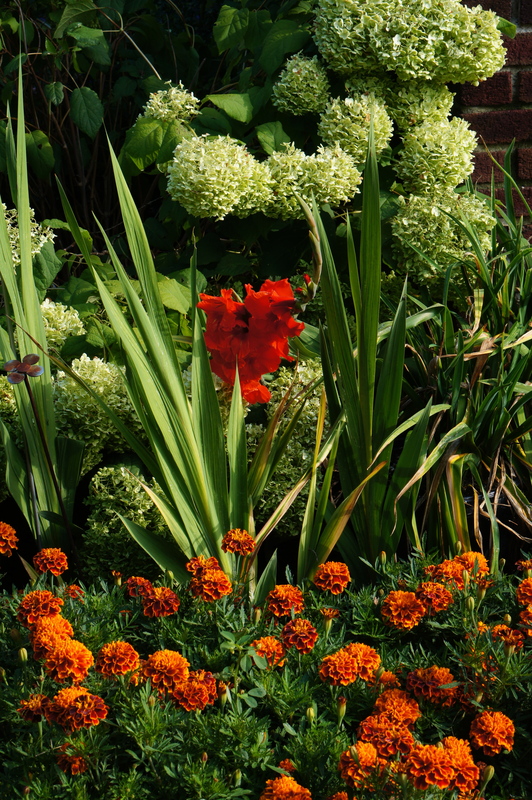 And here’s a shout out for Carol at May Dreams Gardens. 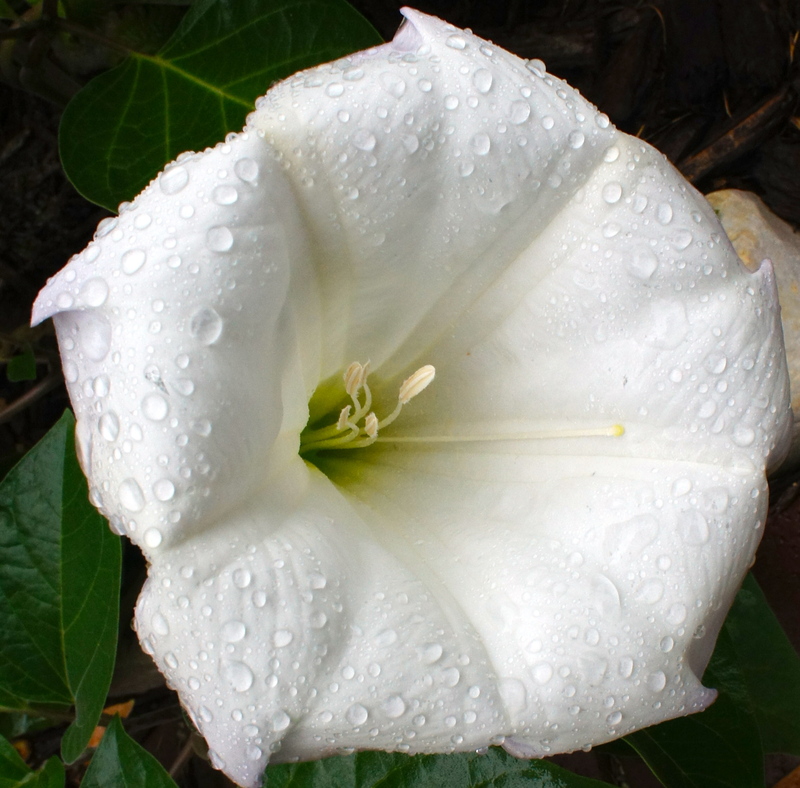 The datura just keep blooming. 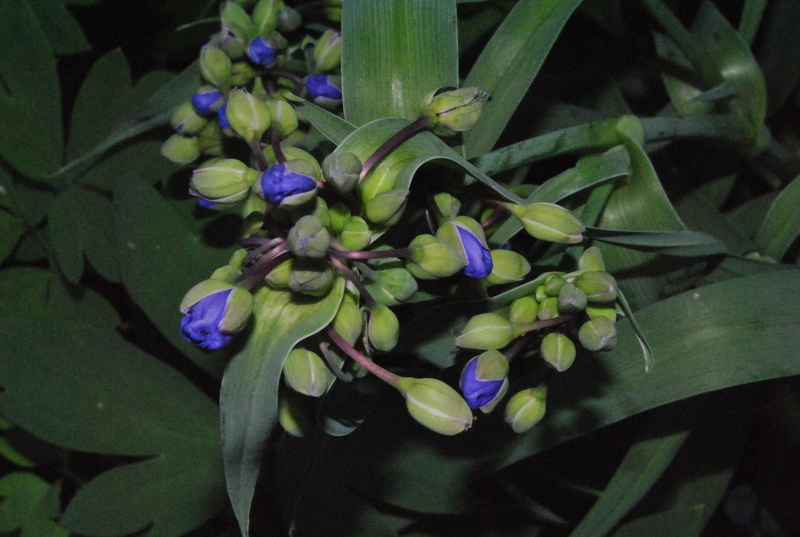 And because it is a wet and gloomy day, last night’s blooms have remained open. 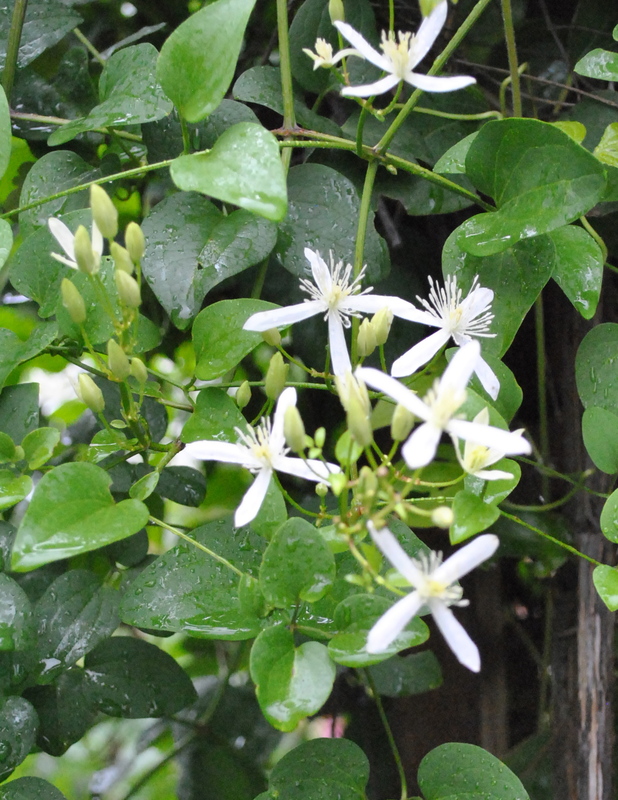 Sweet Autumn clematis is in full bloom, both at the entrance to the Secret Garden and in the lower garden. Notice that I have experimented with a few bricks. 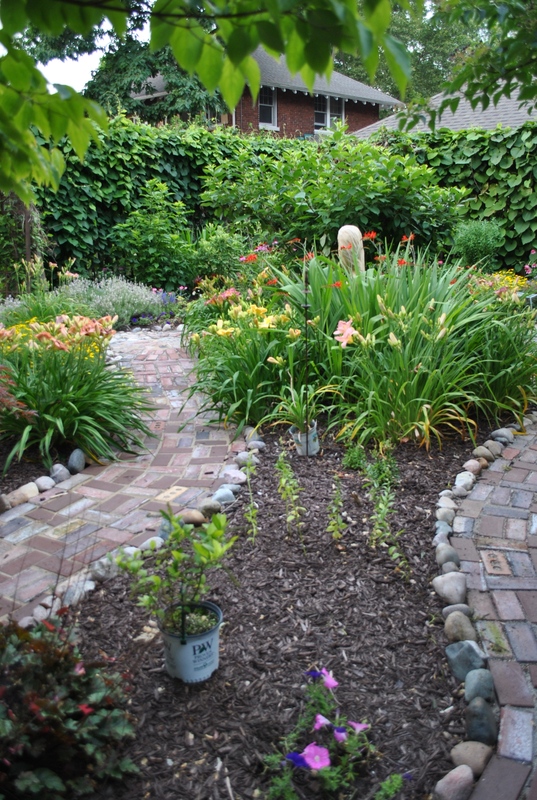 My big news, though, is that in a couple of weeks my crushed limestone paths in the Secret Garden will become bricked pathways. 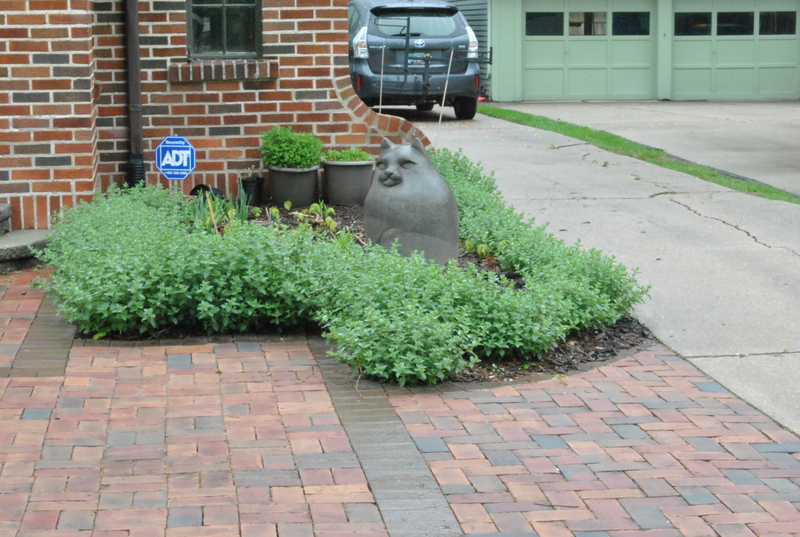 I initially thought I would hire a landscaper to do the job. 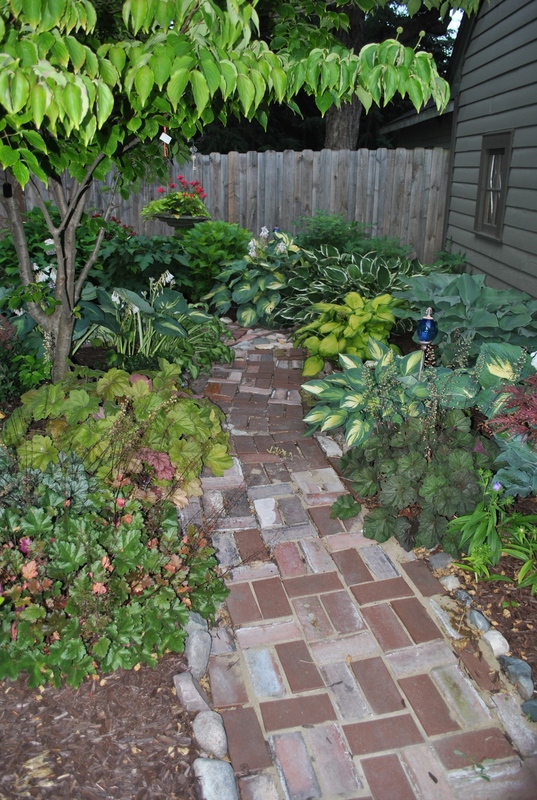 But my garden guru Dale has a neighbor who needed to get rid of more than a thousand bricks that were once a retaining wall. 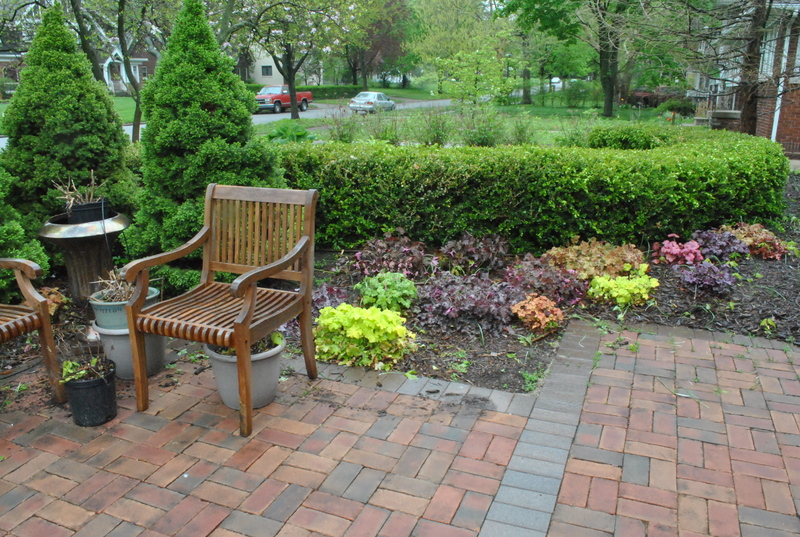 And, my friend Maja in Maine volunteered to lay the bricks. So, rather than the sterile perfection of a professionally laid path, I’m going to get something far more interesting and meaningful. 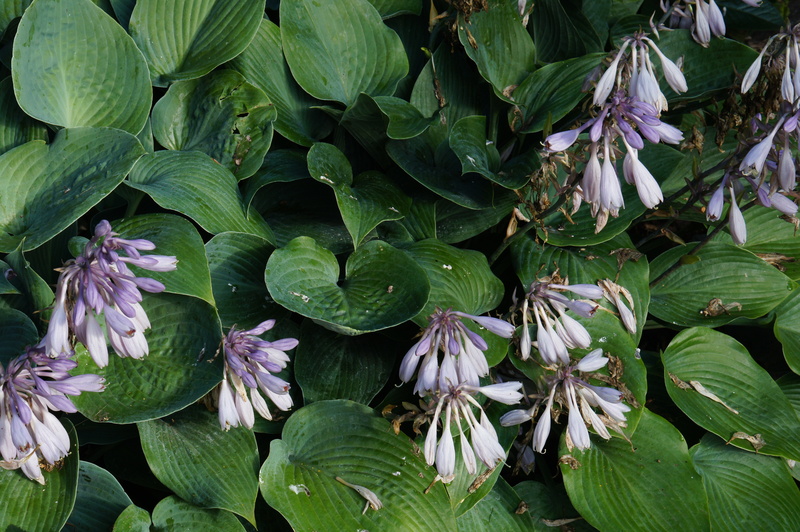 These lovely little stars send out a subtle fragrance and from a distance create a halo of white on the arbor and on the fence in the lower garden. 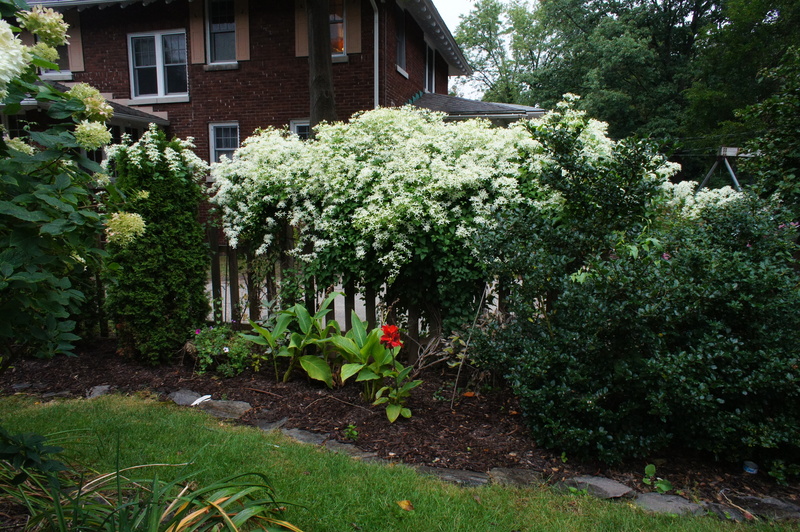 Sweet Autumn clematis taking over the fence and spilling onto one of the arborvitae. And, of course, I’ve been playing with bricks. At first I thought I would need to get rid of the crushed limestone, but now I think it will create a good foundation for the bricks. 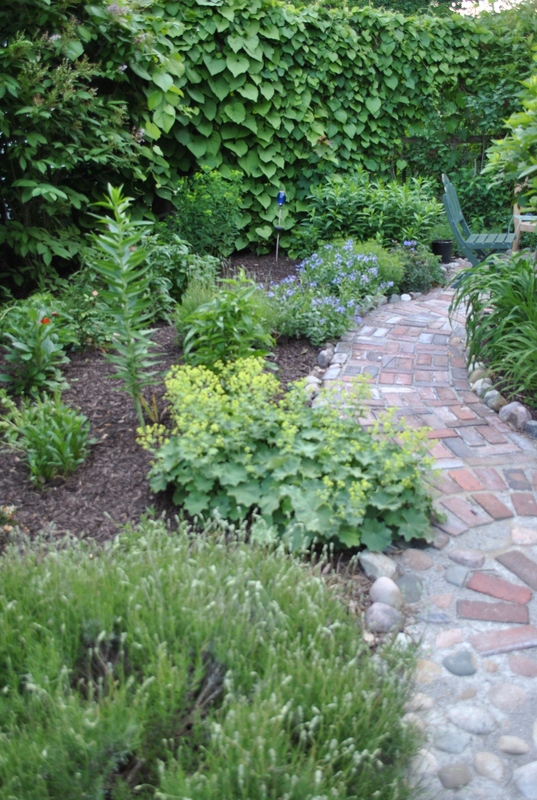 This means the pathway will be a little higher than it is “supposed” to be, but I suspect that won’t be a big issue, especially when fresh bark is spread on the garden next spring. 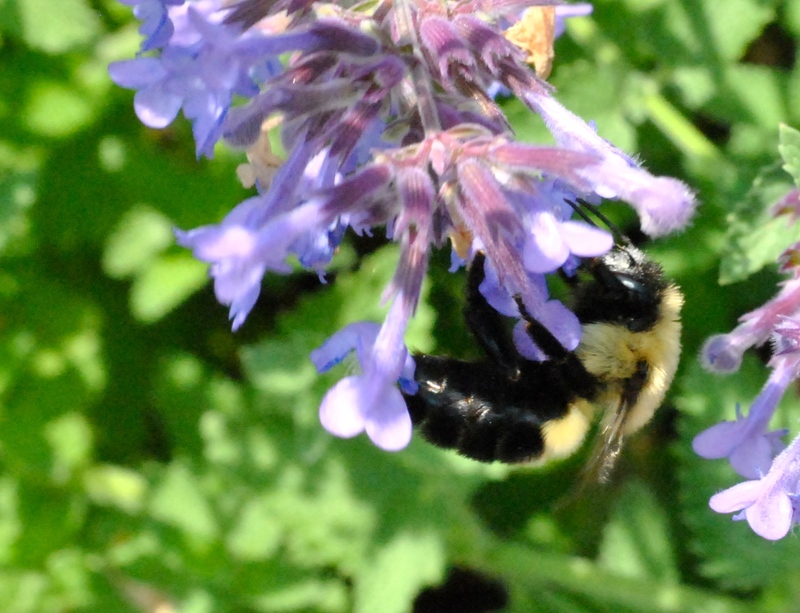 The Walker’s Low catmint in the entrance garden are lush and on sunny days a lure for bees. 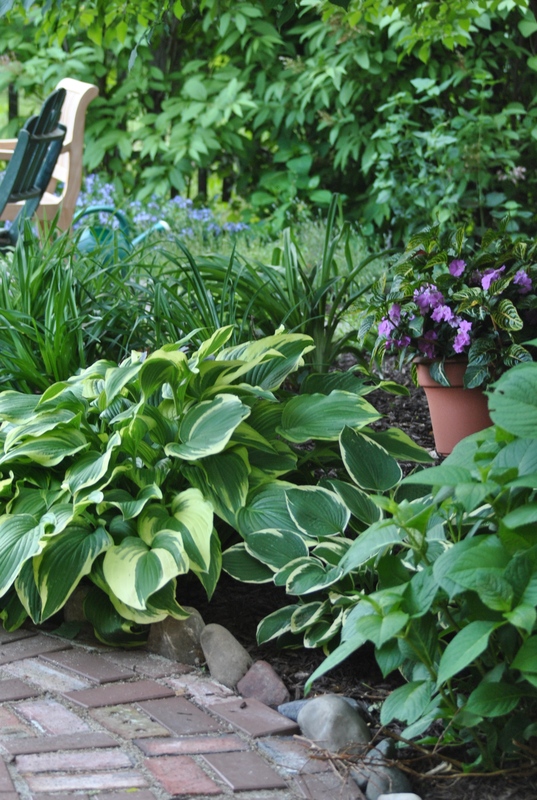 There are several pots of rudbeckia and some yellow blackberry lilies ready to plant. 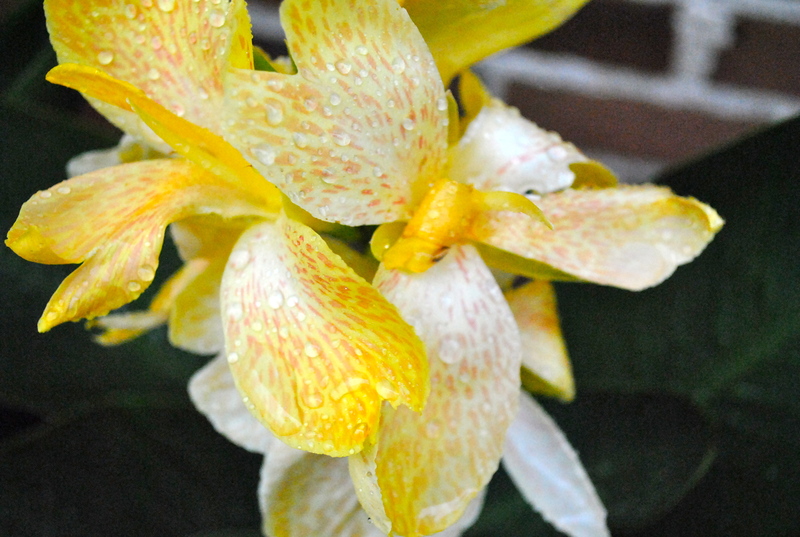 Rain-dappled yellow canna at the side of the house. 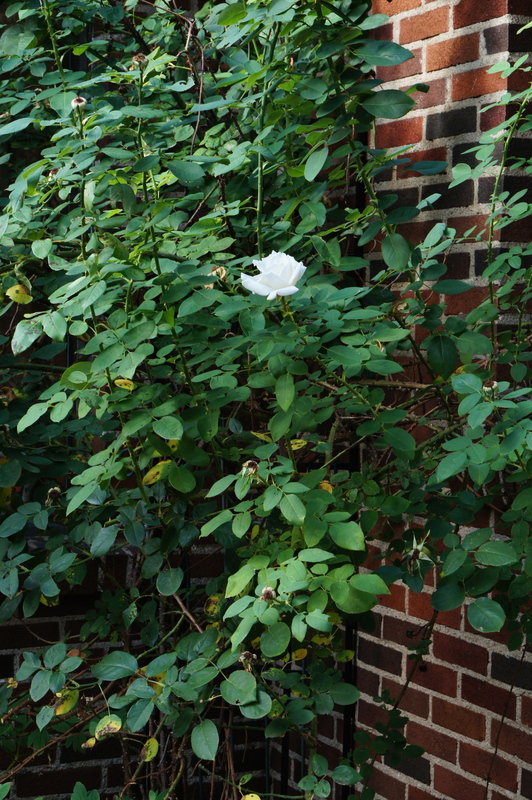 Nameless white climber in the corner garden. 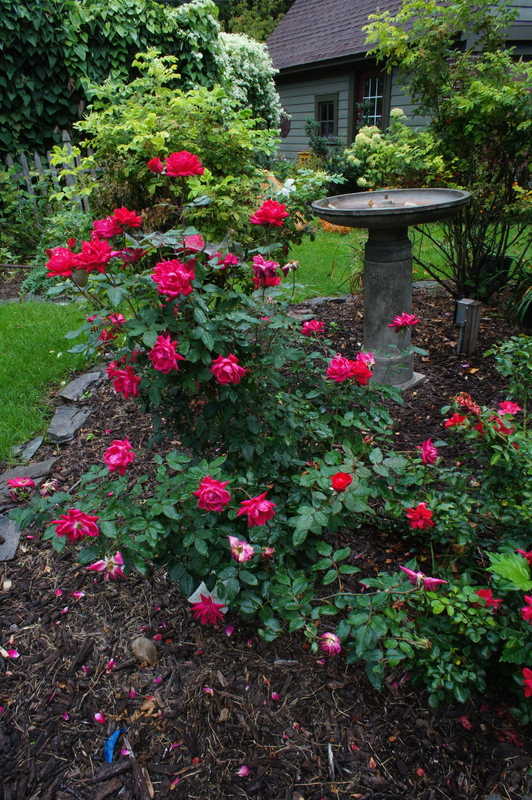 This red Knock Out rose has been blooming like this all summer. And the Carpet Rose next to it has been doing almost as well. 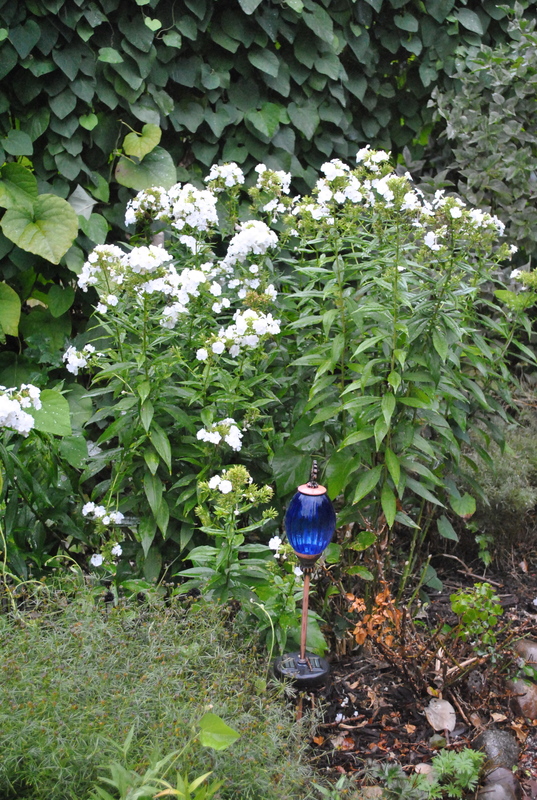 White Phlox in the Secret Garden. 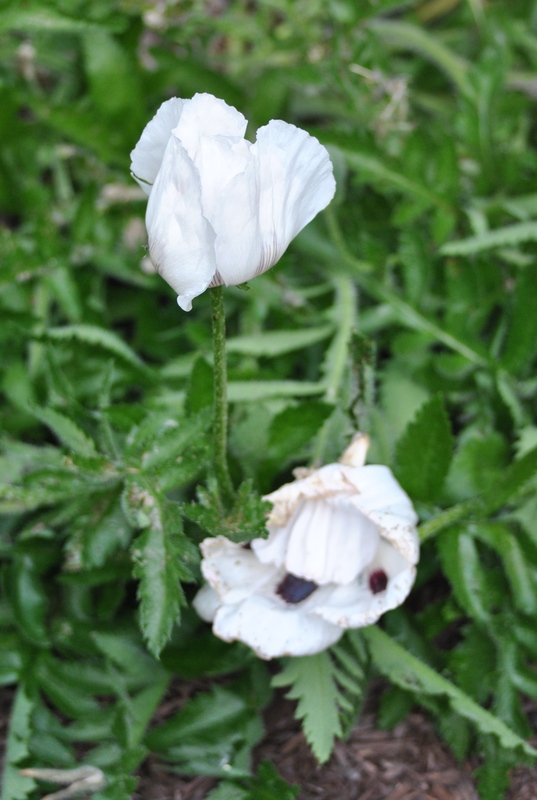 The Honorine Joubert anemone are blooming in the Secret Garden. 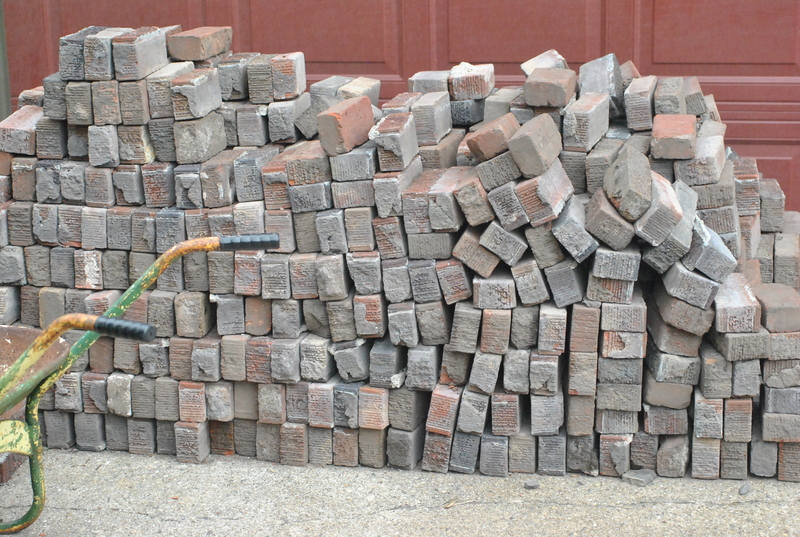 Aproximately 1400 bricks waiting to become a pathway in the Secret Garden. 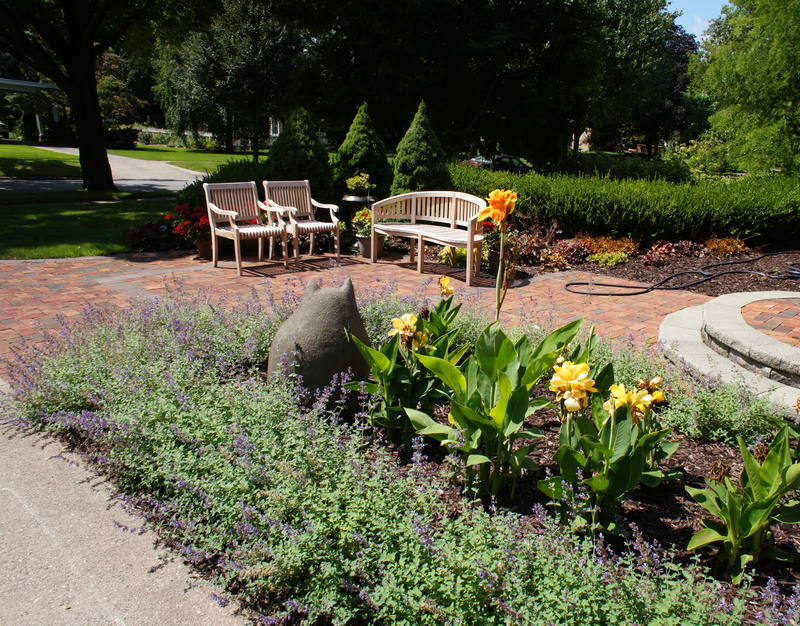 The entrance garden with Walker’s Low catmint and cannas. Here’s what’s bloomin’ on this mild August morning. 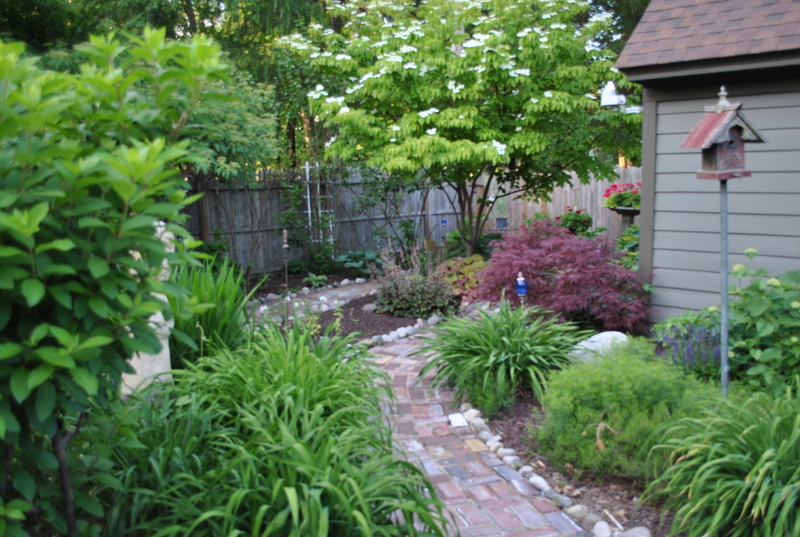 Looking east in the Secret Garden. 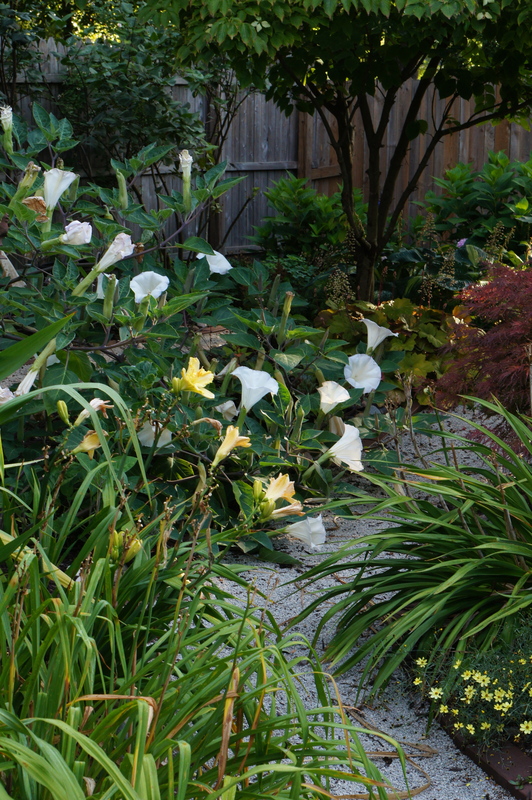 The daylilies are just about finished, but the Datura is taking over the universe, again. 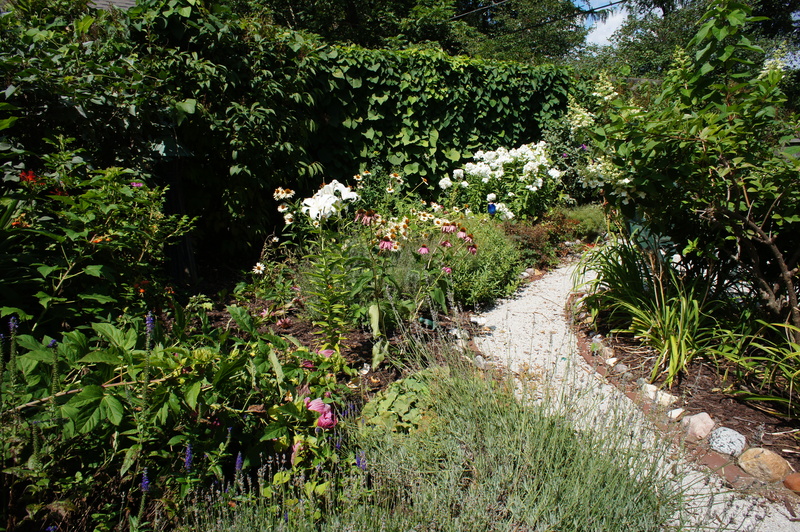 Looking south in the Secret Garden. 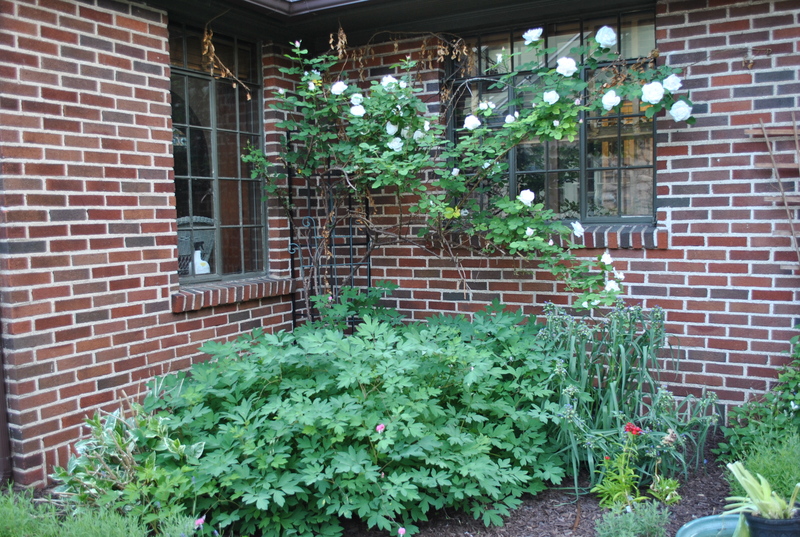 The old rambling rose that a neighbor gave me still cranks out late blooms. The Knock Out Rose and the red Carpet Rose continue to give me blooms. 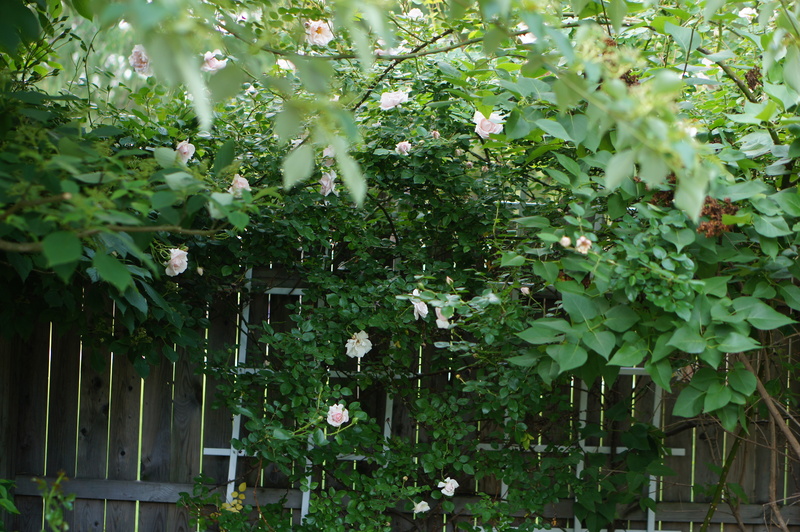 The hansa roses in the background are getting their second seasonal wind. 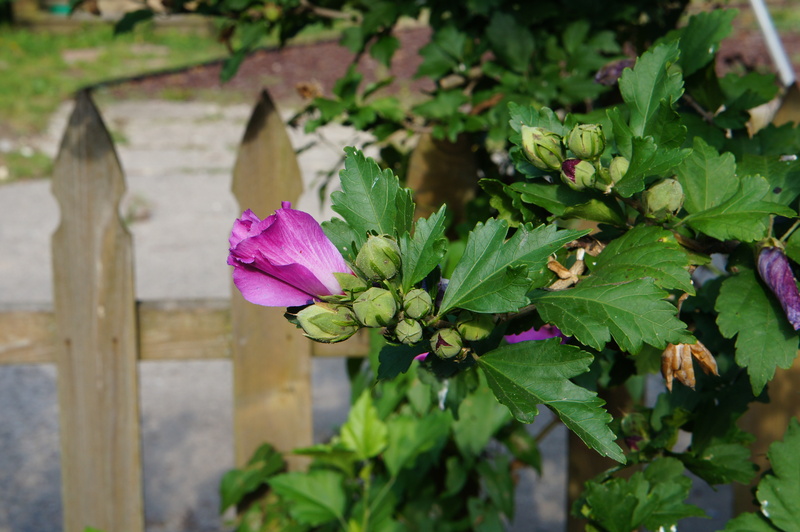 Rose of Sharon with a few red cannas. 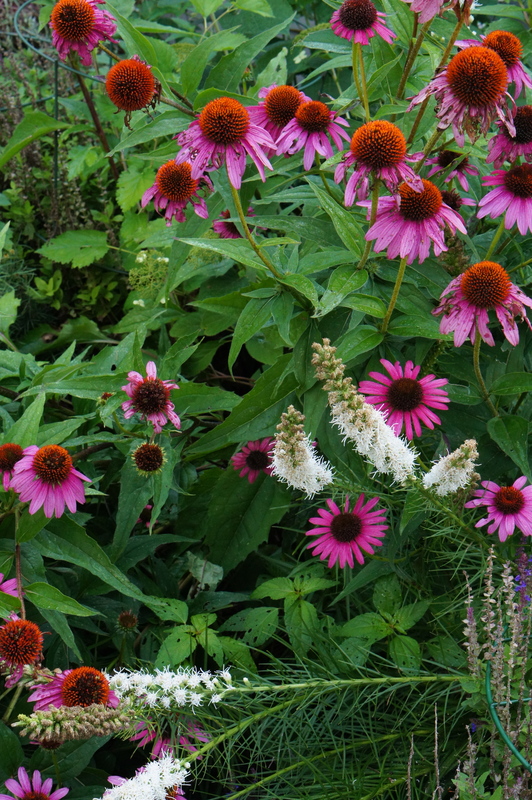 A mishmash of white liastris and purple coneflowers that a friend gave me. 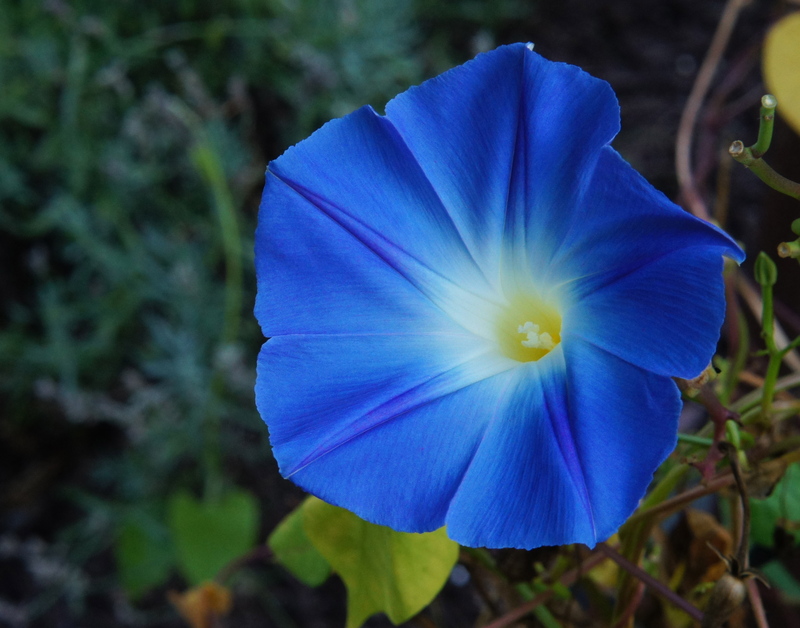 A morning glory doing what it does best…being blue. 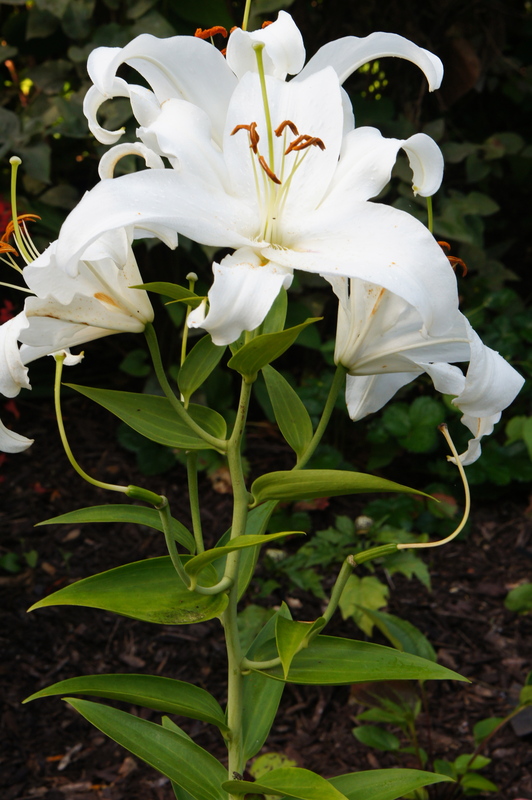 Asiatic lily in the Secret Garden. This is its first season and it is doing beautifully! 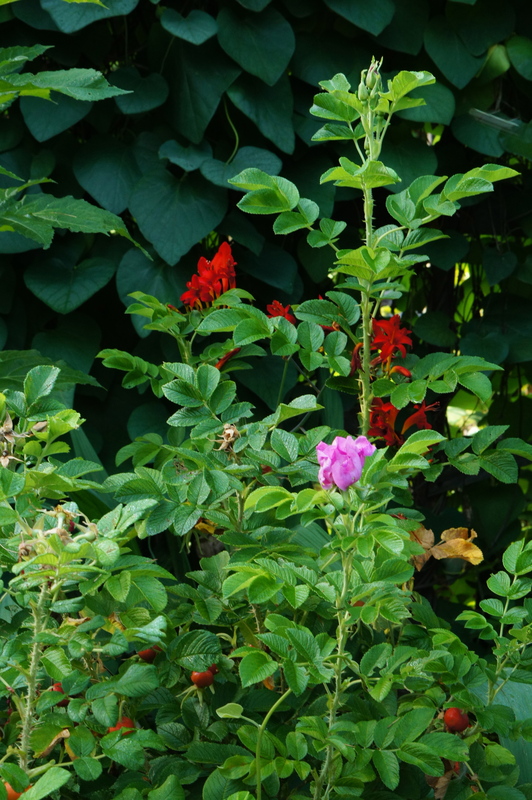 Wildberry hansa rose in the Secret Garden with a few crocosmias. 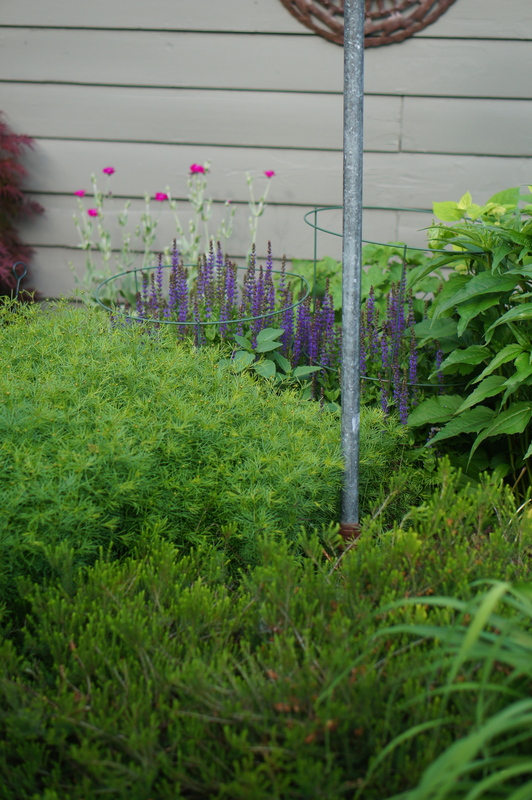 This clump gets more shade so blooms a little later than the other clump. 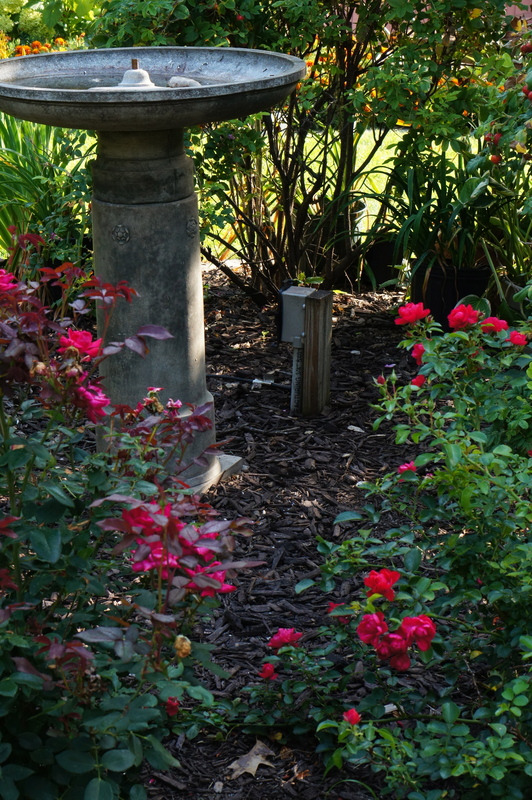 A shady little nook in the back of the Secert Garden. 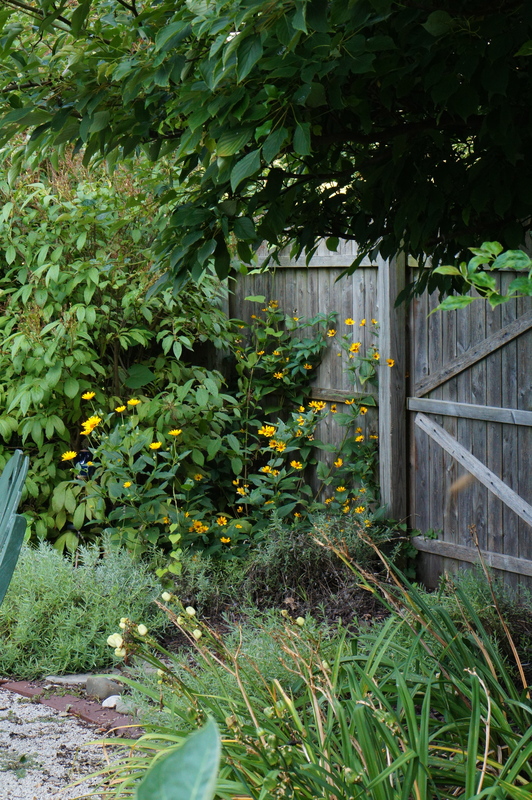 The moonflowers are going bananas, as usual. 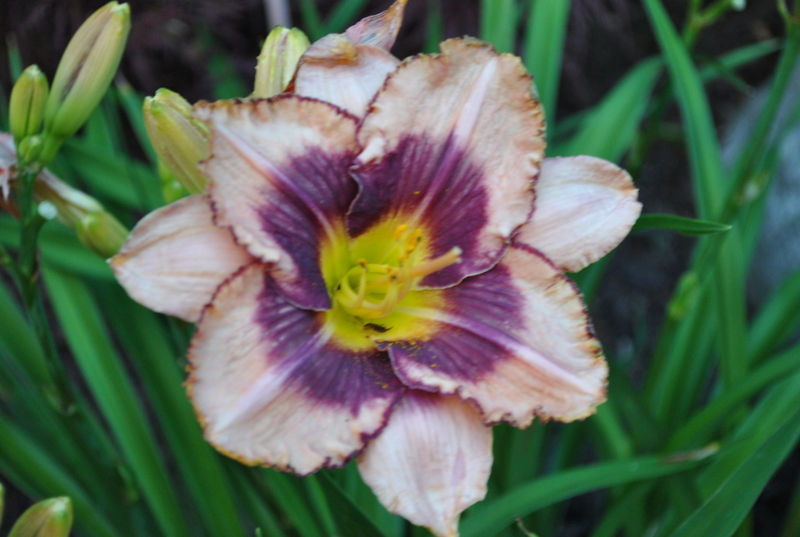 And, there are few First Knight daylilies still blooming. 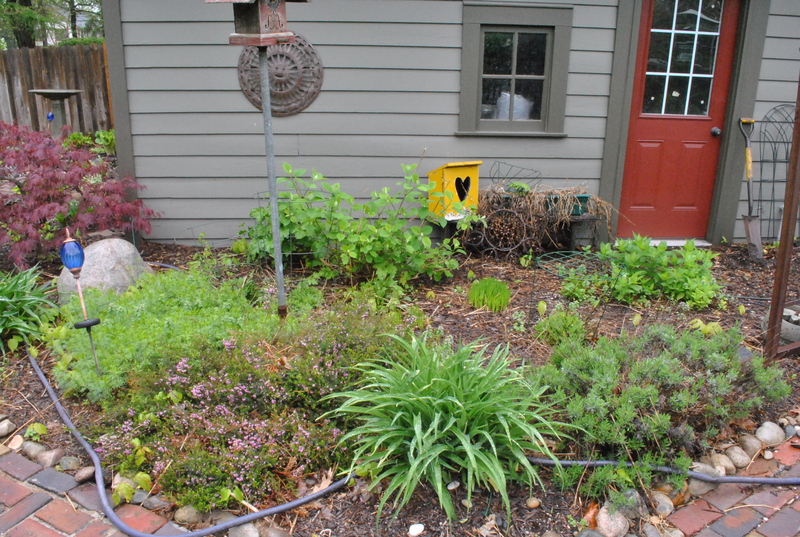 In the bottom right are a few Moonbeam coreopsis. 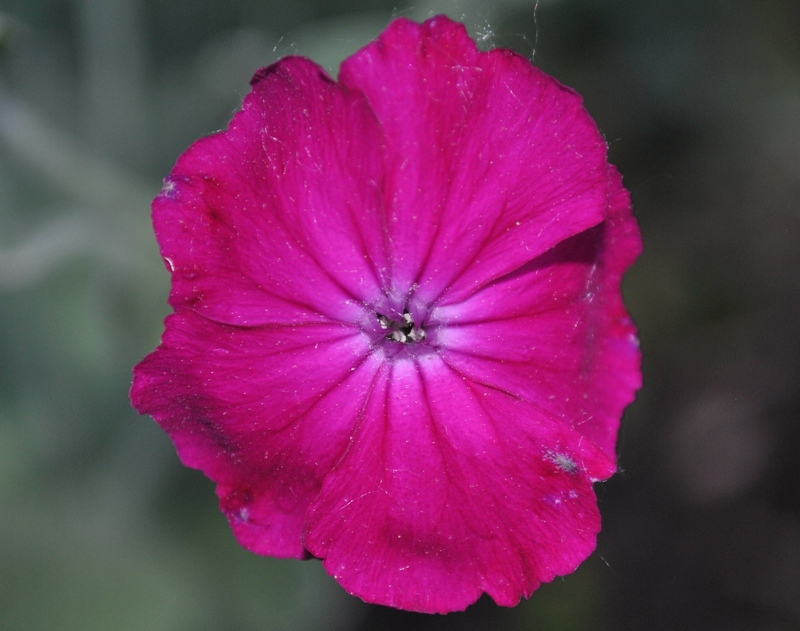 A neighbor game me a clump of rose campion years ago and it continues to do well. 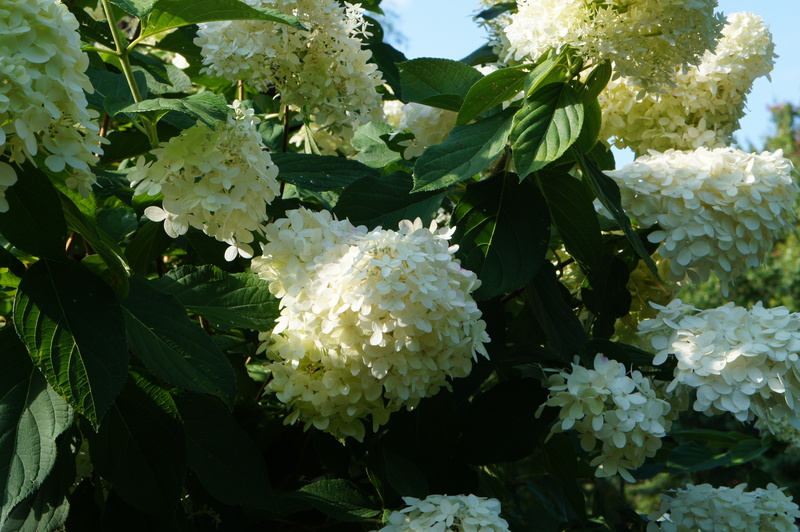 There are also a few White Dome hydrangeas here and the anemone that a friend gave me is just starting to bud out. 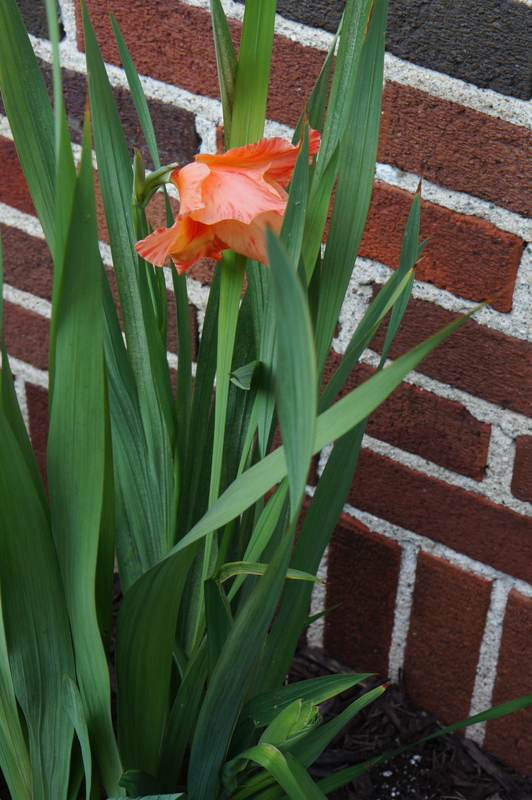 This gladiola doesn’t know it’s an annual. It comes back year after year, probably because of the warmth that comes through the foundation wall. 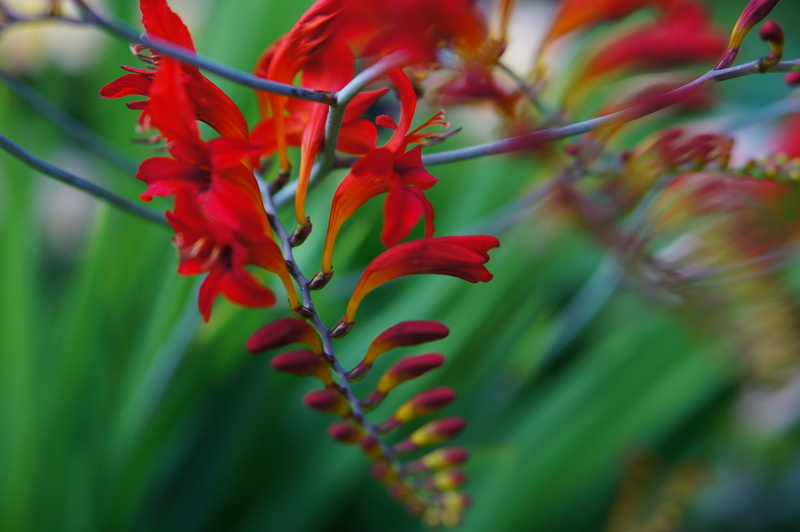 I didn’t plant this and spent a number of years trying to get rid of it. Finally I decided to just admire its will to live. 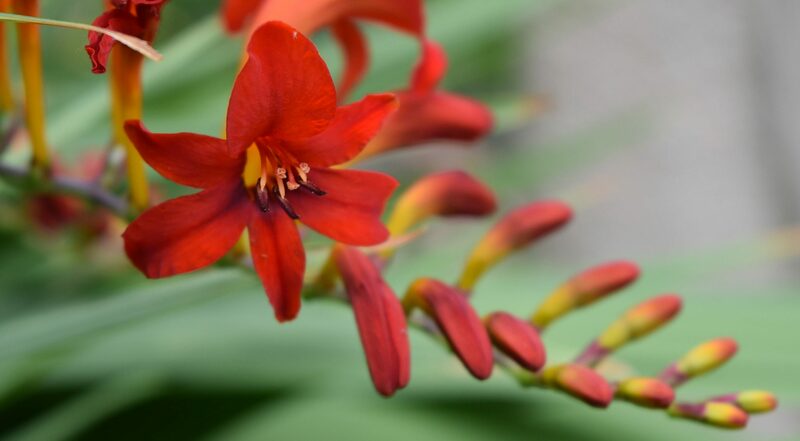 Crocosmia adds such a wonderful pizazz to the day lily bed. I love the way it drapes over the Garden Lady. 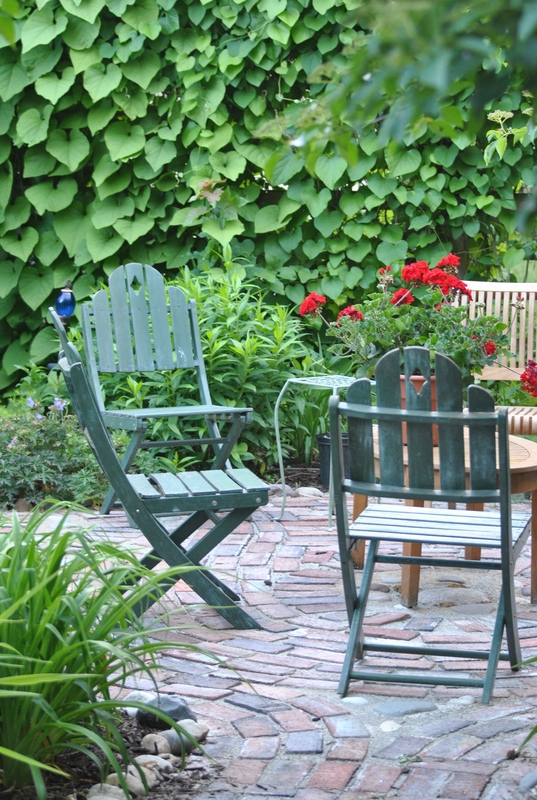 The temps rose yesterday to 90 degrees, but the heat isn’t unexpected. And, we are not experiencing a drought like last year. 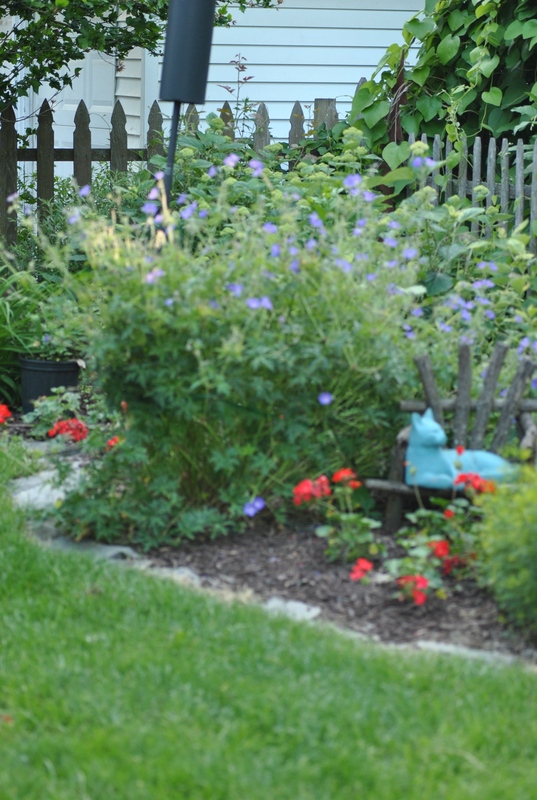 July blooms are on schedule and it seems like the whole garden is making up for last year. The cherry tree is still full of gorgeous red tart cherries. In fact, I picked 4 cups last night and made a cherry crisp. Last year I didn’t even bother with picking. The early warmth and subsequent freeze killed last years crop. 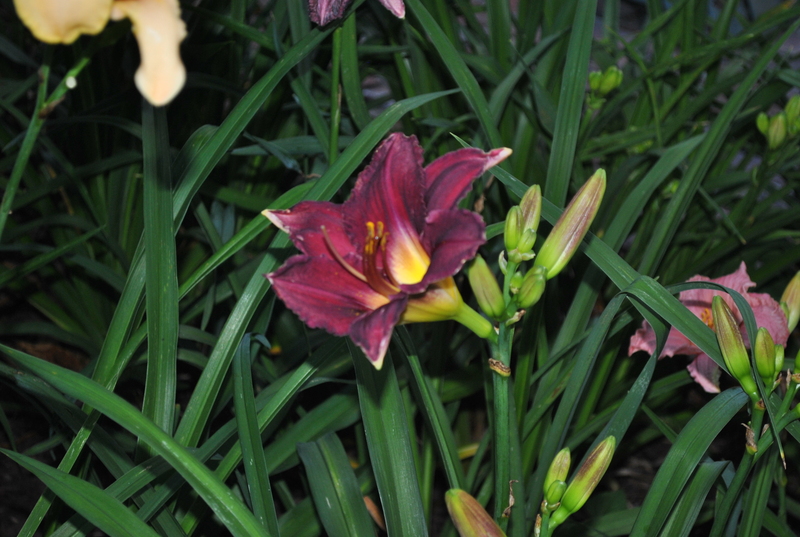 First Knight day lily, one of my favorites. 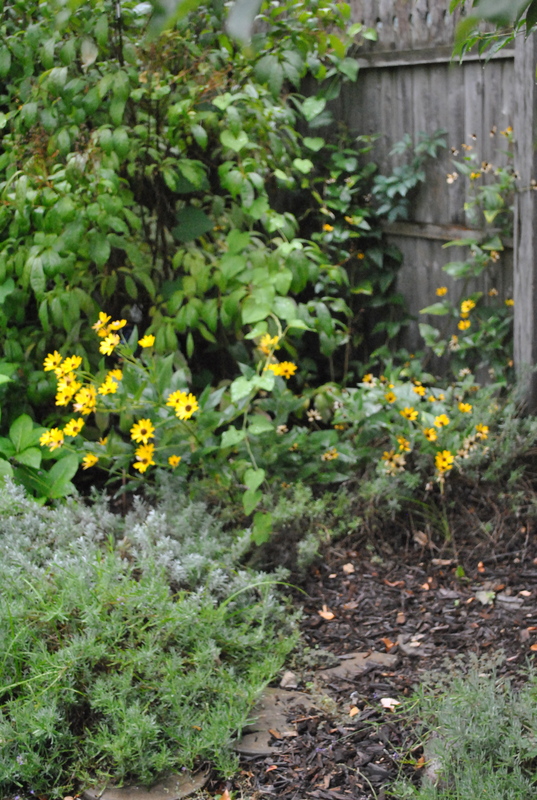 Zagreb Coreopsis and rose campion that a neighbor gave me years ago. 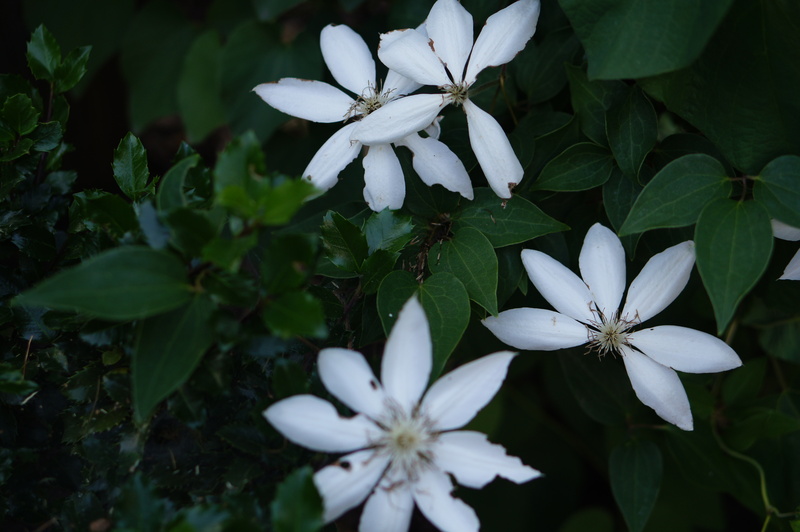 A few white clematis keep blooming. I didn’t get much of a show this year, but will take whatever I can get from this lovely vine. 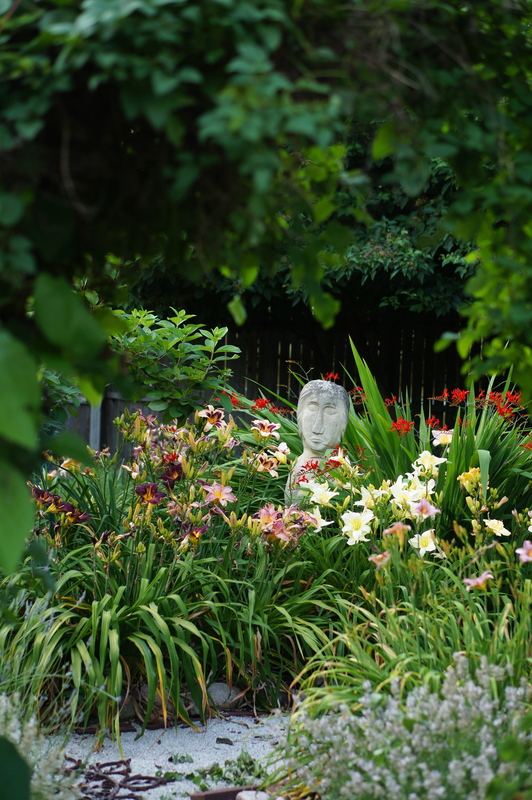 The Garden Lady is framed in day lilies and crocosmia. 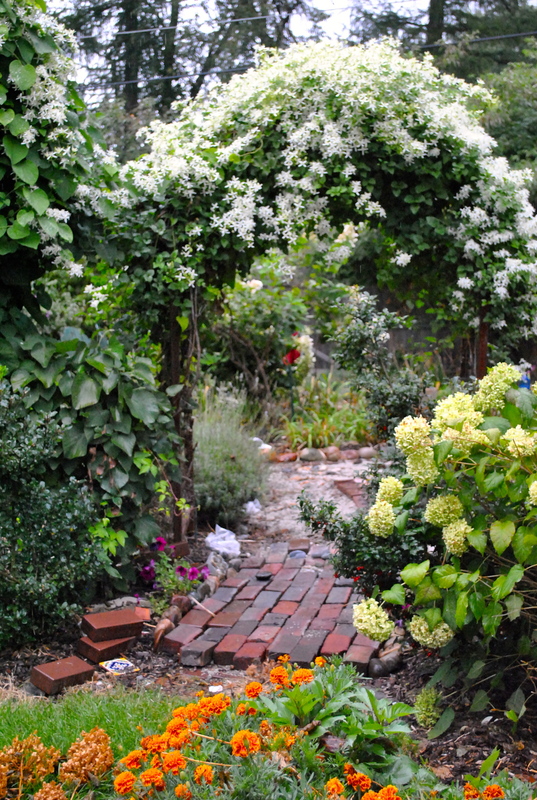 The is the view from the entrance of the Secret Garden. 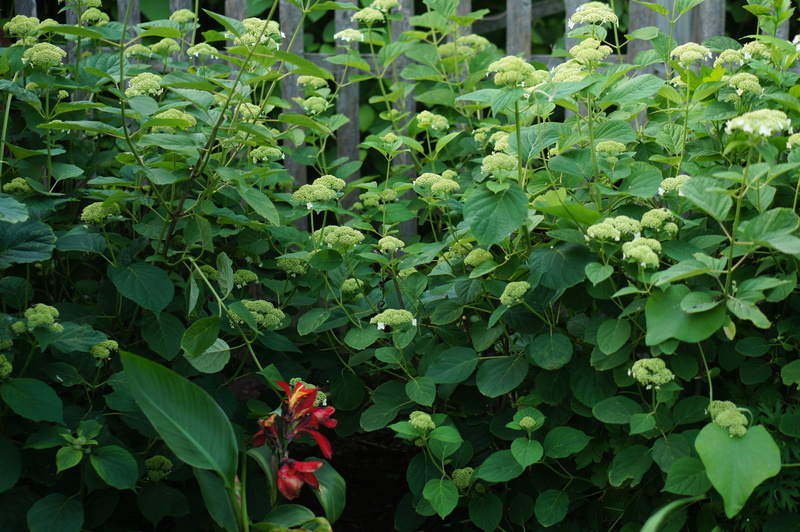 Annabelle Hydrangea putting on a great show. Last year Annabelle did not do much because of the heat. 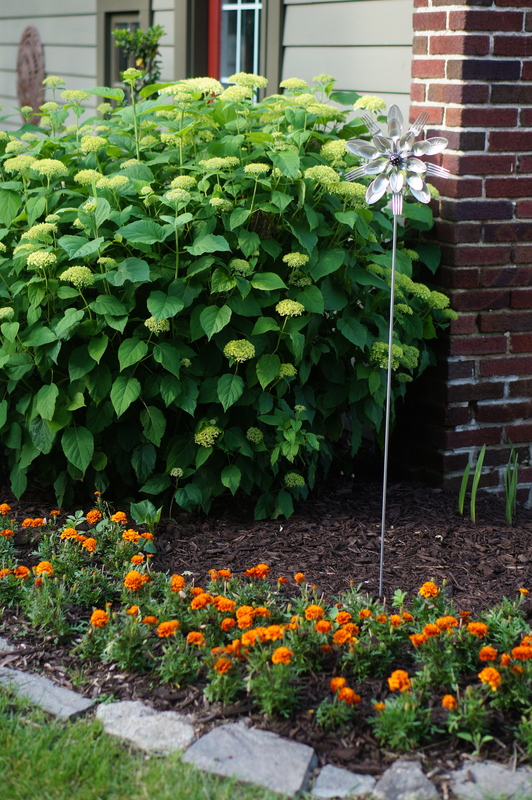 White Dome hydrangeas and Zagreb coreopsis in the lower garden. 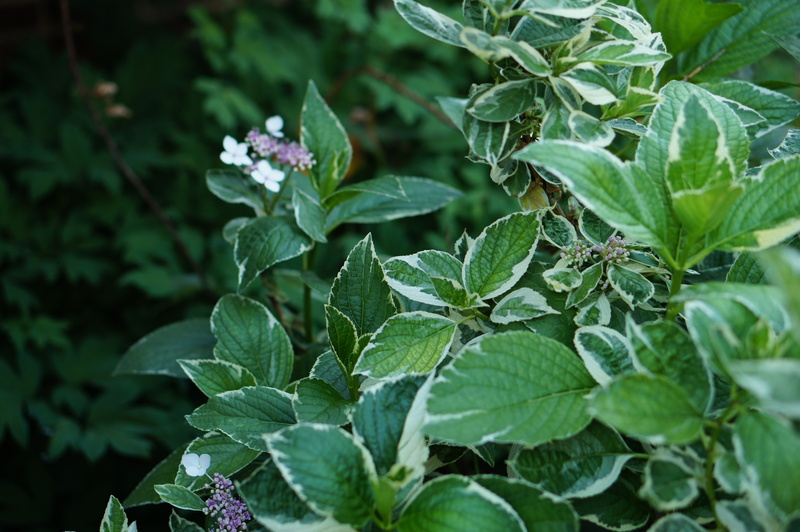 This is about as blue as this variegated lace cape hydrangea gets. Each year I ammend the soil with acid and it never seems to be enough. 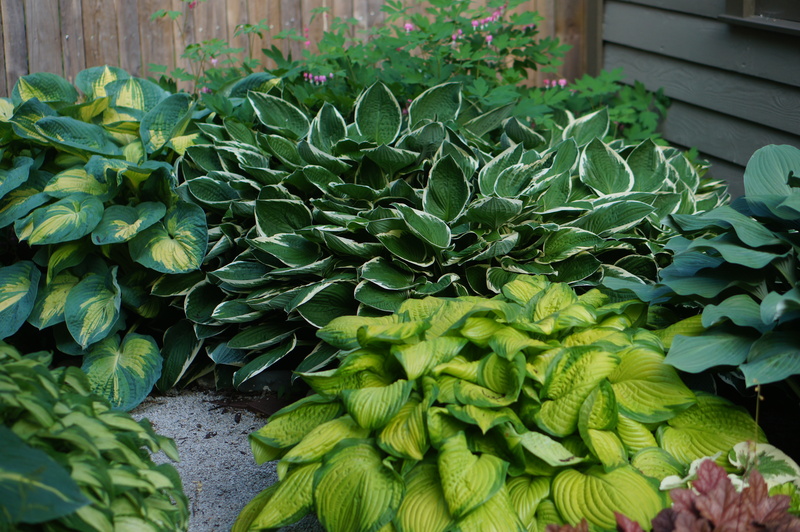 The Francis Williams hostas in the front garden are starting to bud. 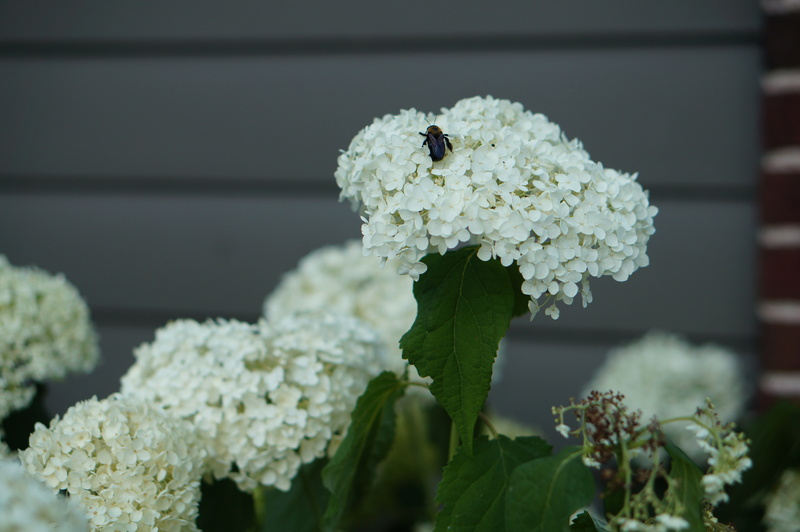 Behind them are the White Dome hydrangeas that are in full lacy bloom. 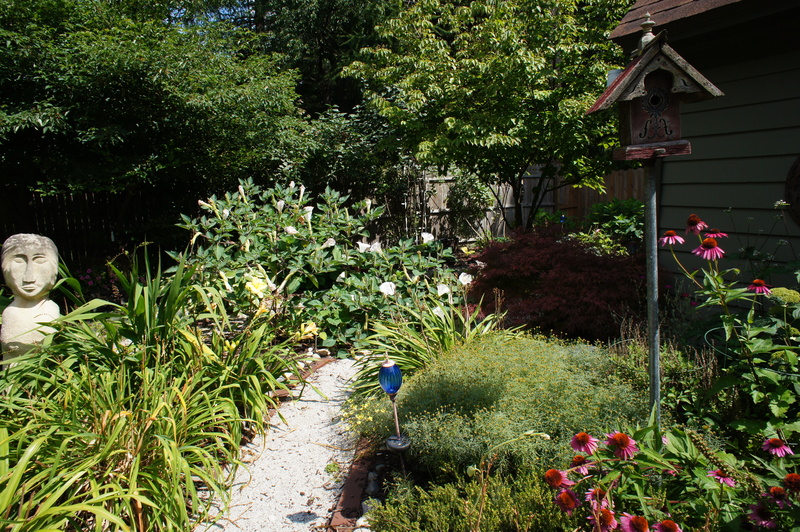 I removed a lot of the Strawberry Candy day lilies in the front when I took out the Pana Rhododendrons. This is one of the only clumps left. 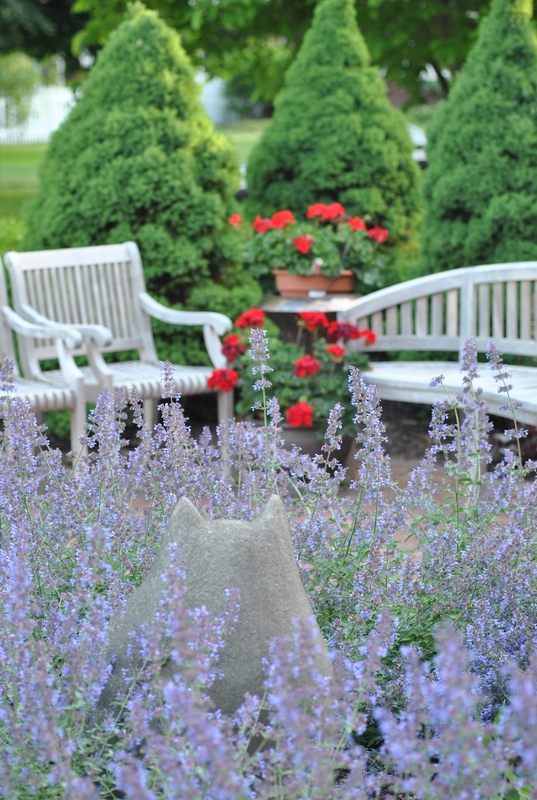 Newly planted just a month ago, the Walker’s Low catmint is doing very well in the entrance garden. 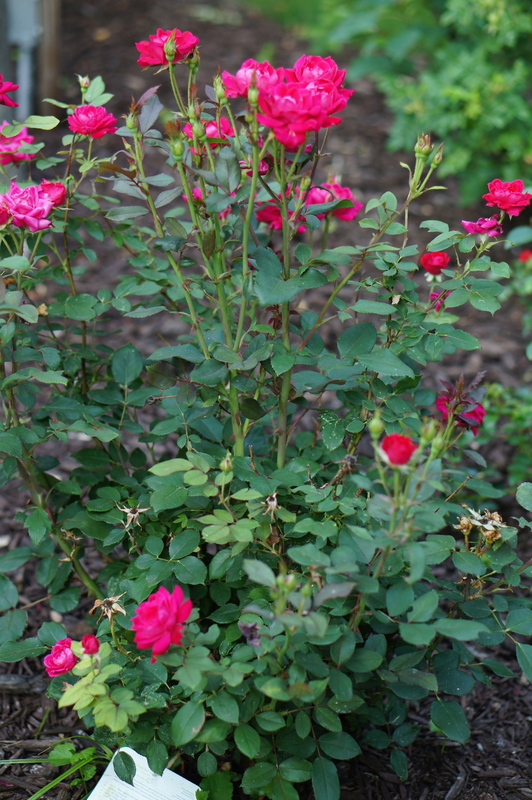 Red Knockout rose in the rose medallion seems to not only avoid disease, but Japanese beetles. 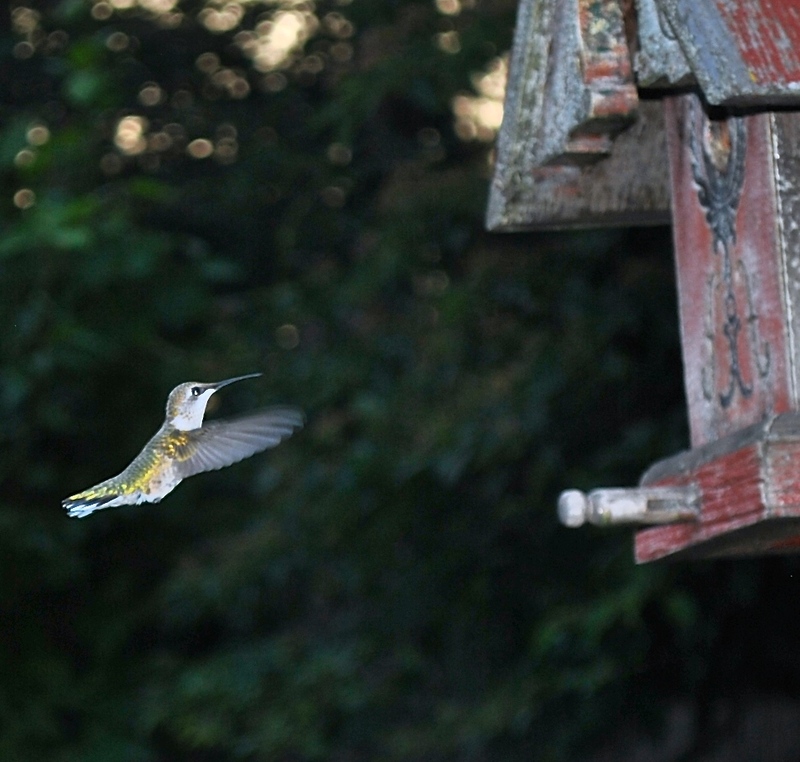 Yes, they’ve arrived for their yearly feast. 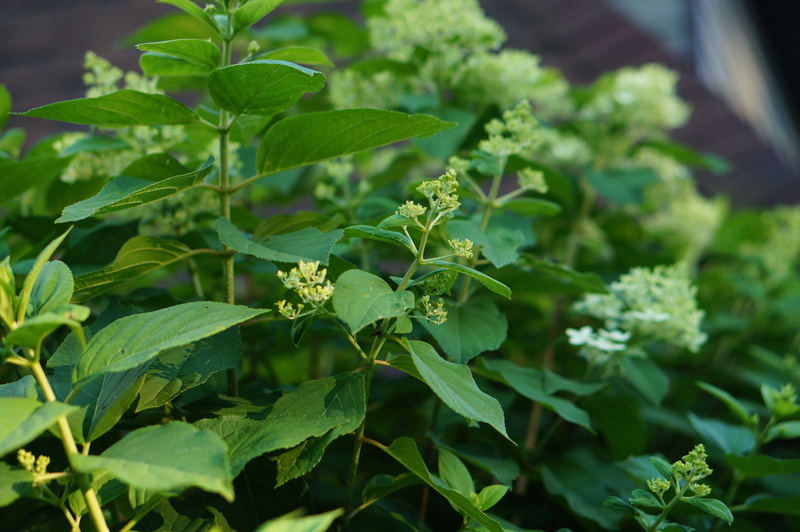 Limelight Hydrangea is just starting to bloom. 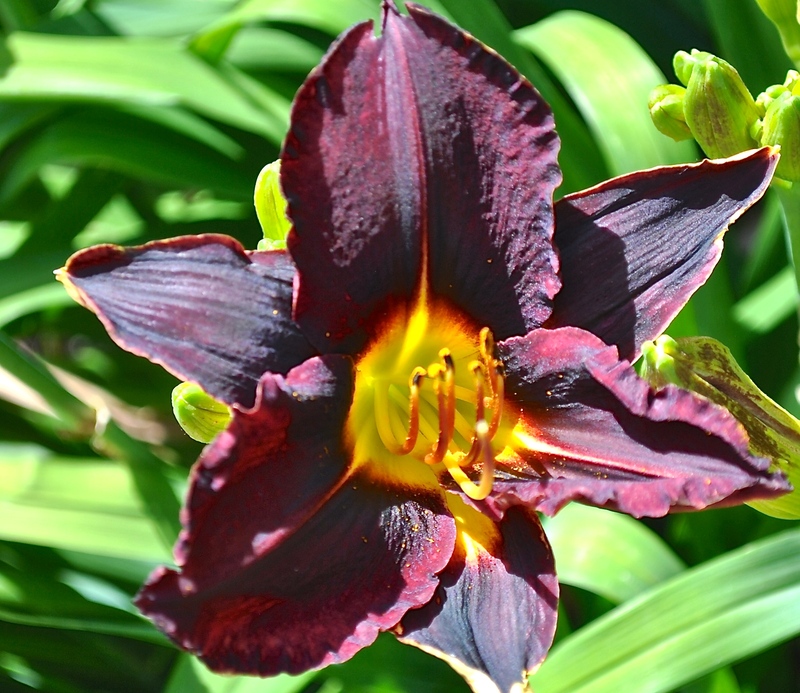 Nameless dark lily doesn’t seem to be quite so dark this year. Looking west from the eastern part of the Secret Garden. 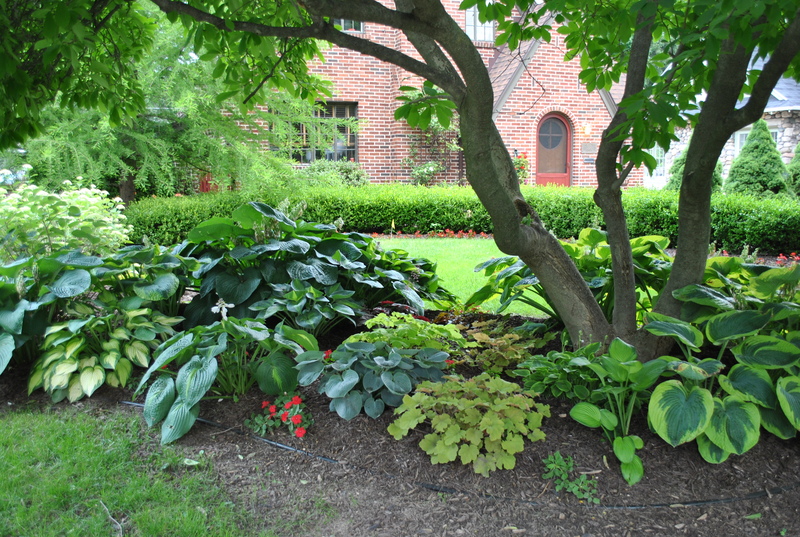 The Japanese Maple and various hostas seem happy. 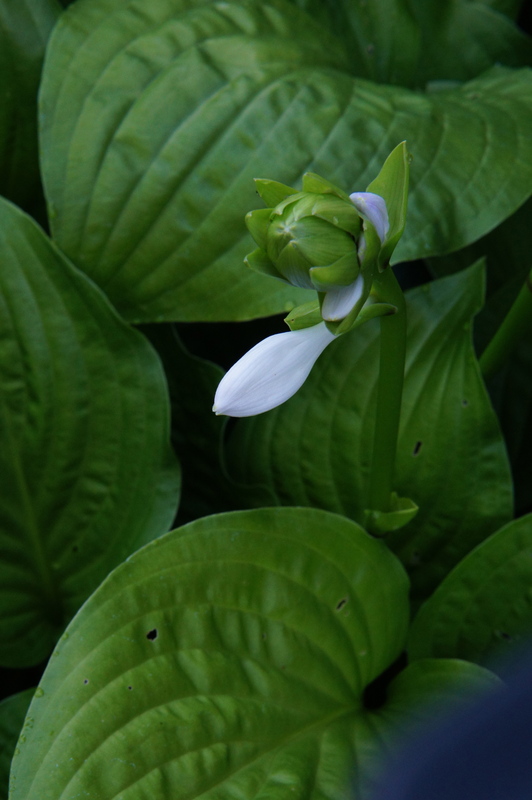 Stitch in Time Hosta is starting to bloom. 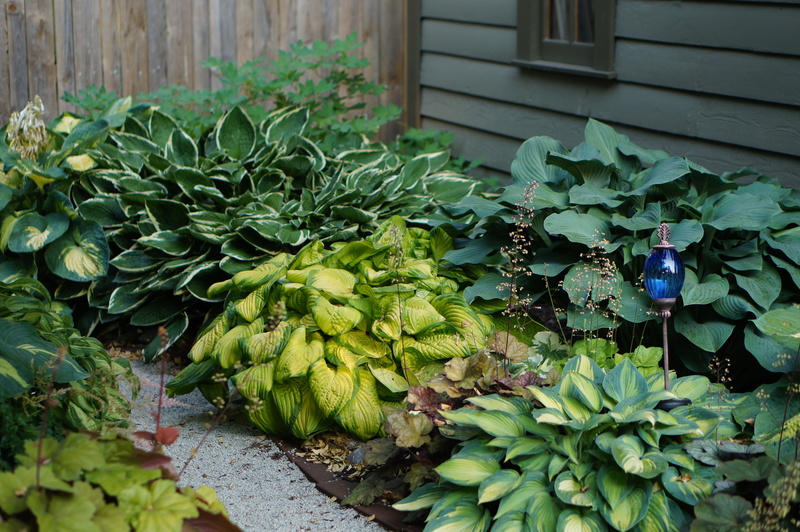 Francee, Stained Glass, June, Great Expectations, and various heuchera. 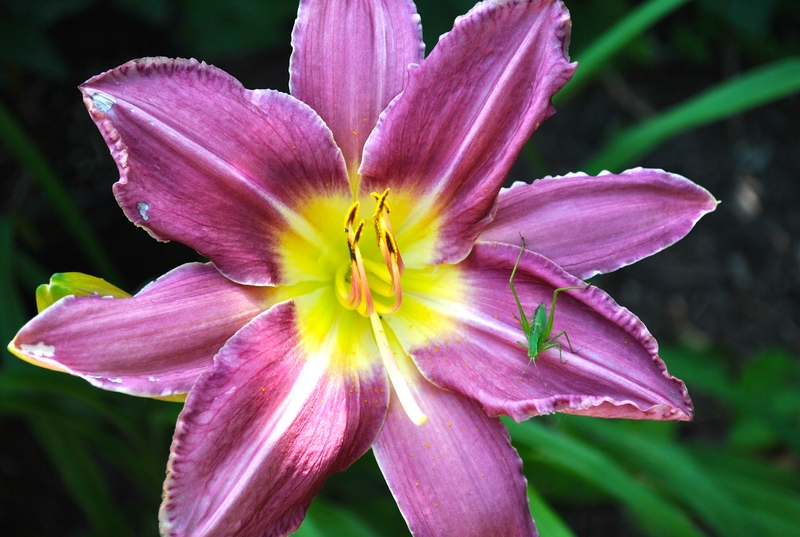 Barbara Mitchell day lily in the Secret Garden. 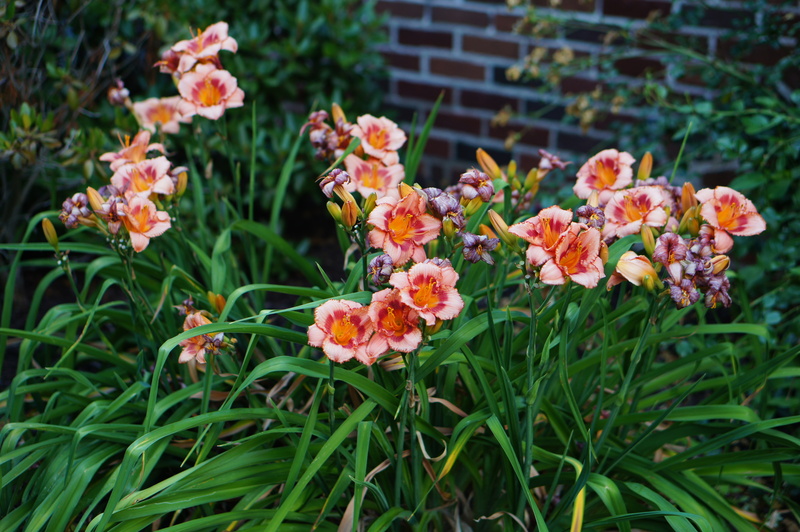 Day lilies and crocosmia in a riot of bloom. 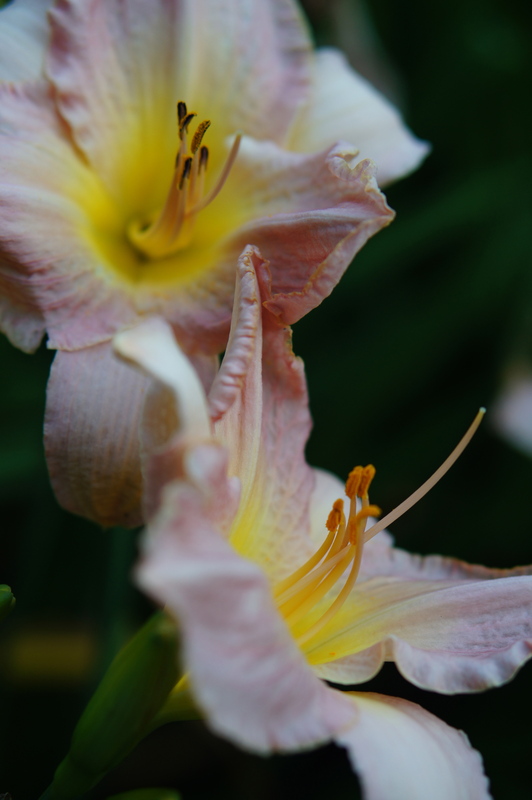 My Sweet Rose day lily. 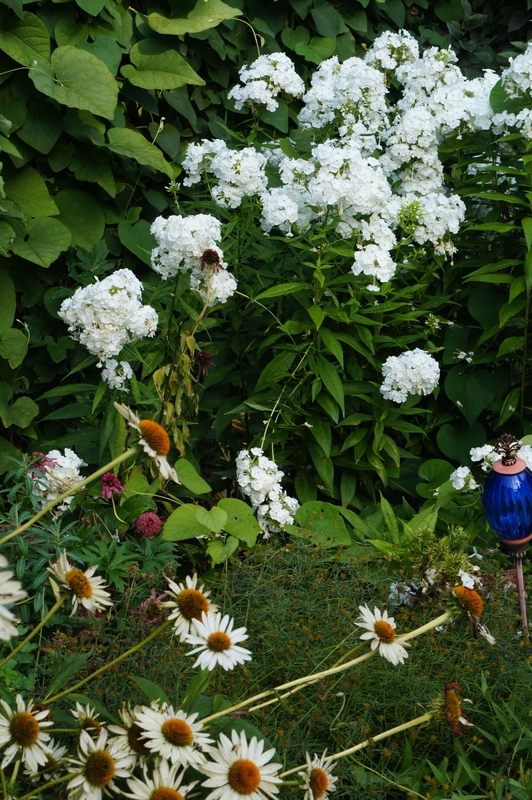 Lavender Doll day lily, Cool Cat Nepetha, Jean Davis Lavender, purple cone flower from a friend, White Dome hydrangea. 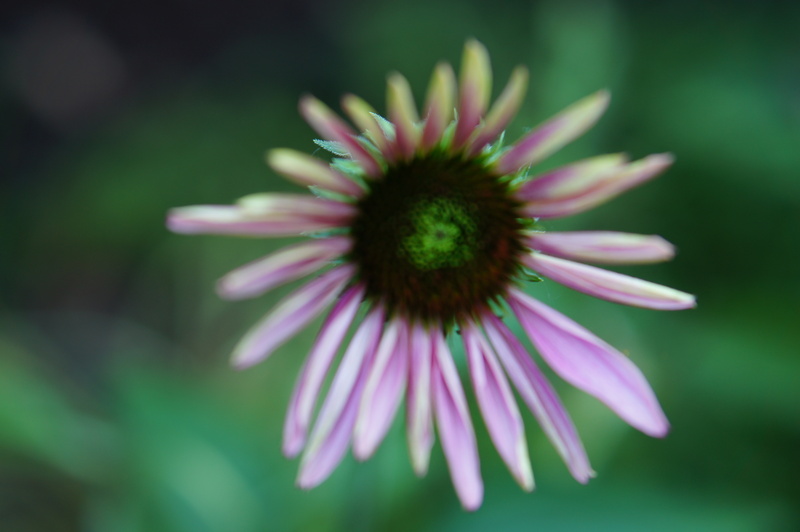 Purple cone flower just starting to bloom. 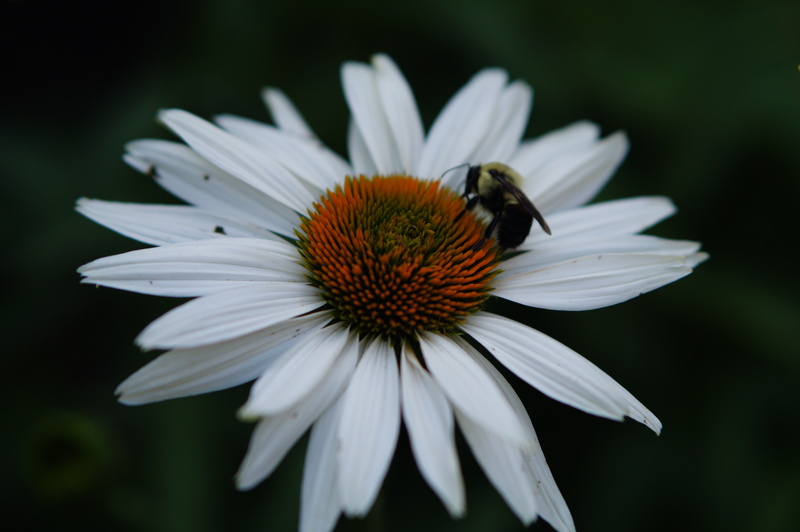 Fragrant Angel echanacea with a friendly bumblebee. 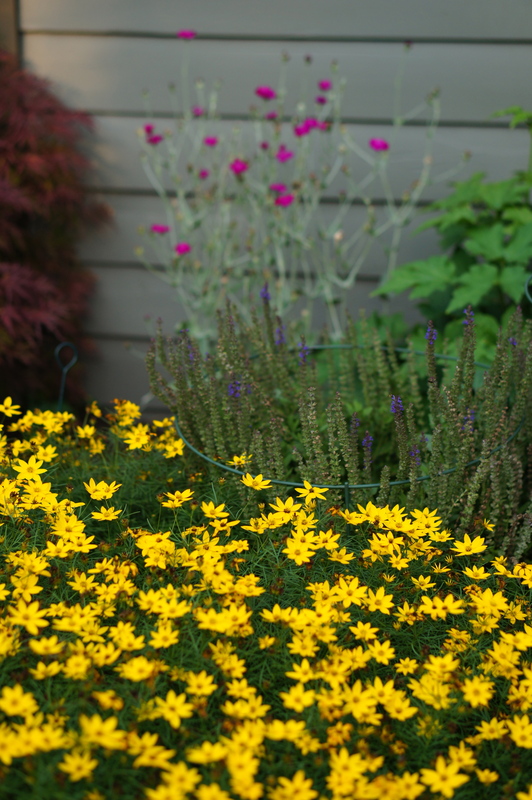 Zagreb coreopsis and a purple coneflower that isn’t sure what she is supposed to look like. 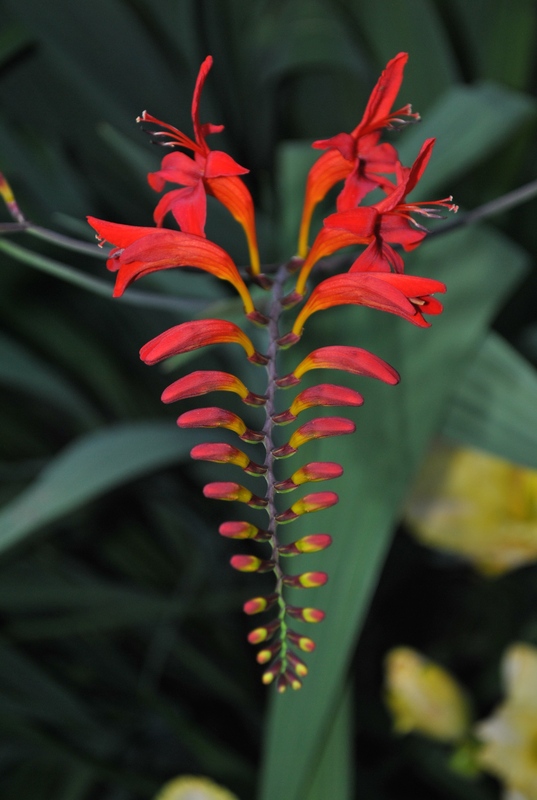 But she’s blooming in her own unique way. 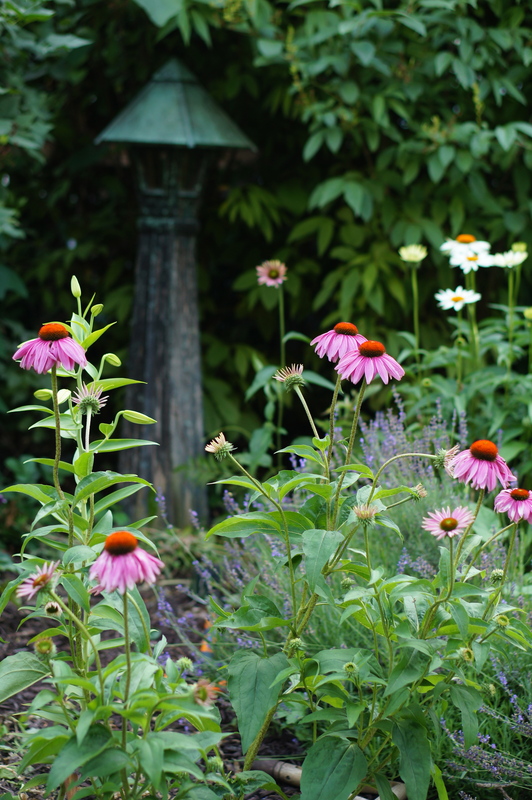 Purple coneflower from a friend and Fragrant Angel echinacea. 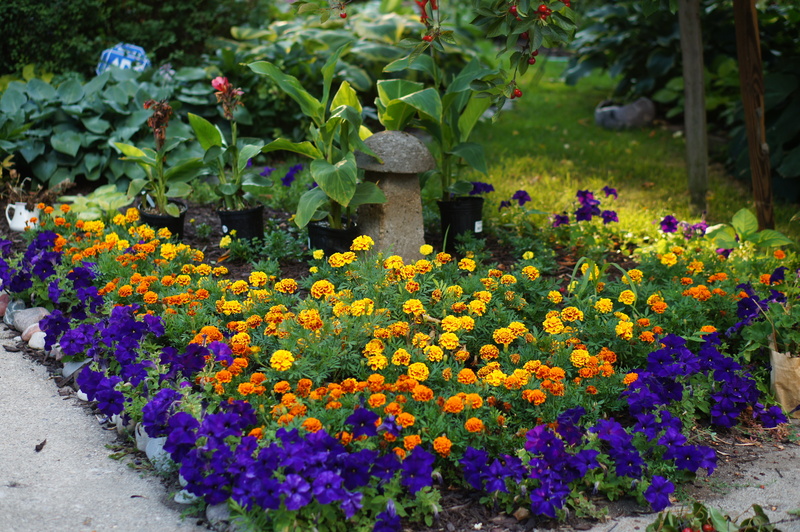 Marigolds and purple petunias greet me at the back door. 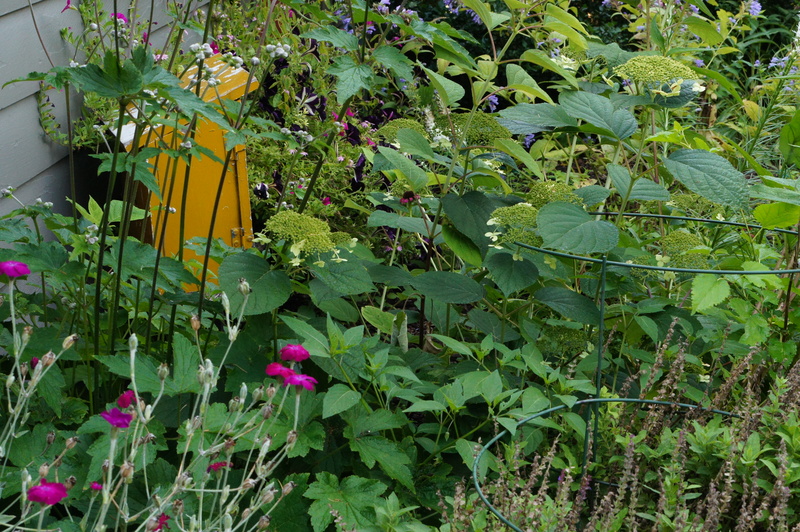 Mid-June is such a wonderful garden moment, and this year it is particularly so. 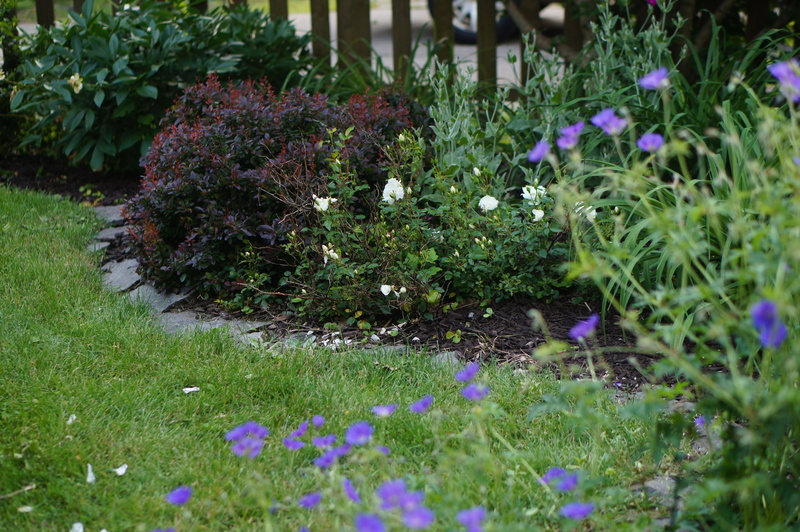 We’ve had a slower spring than last year and the garden seems to be grateful for this leisurely pace. 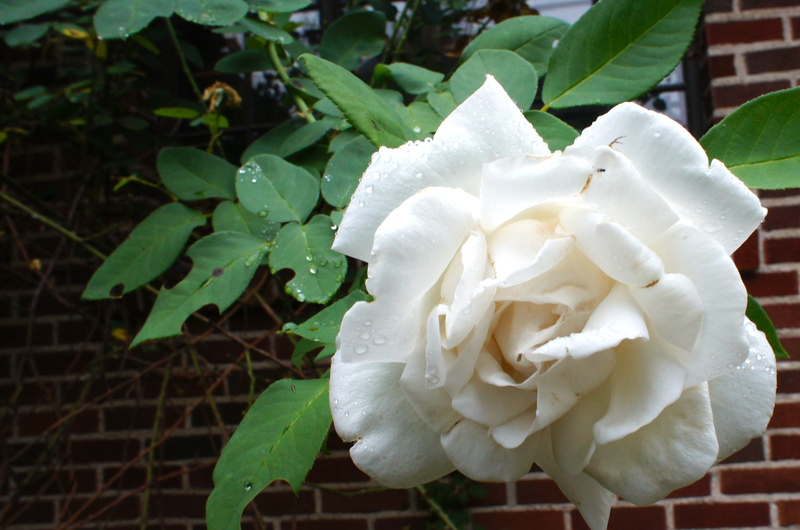 White Dawn rose climbing up the chimney in the entrance garden. 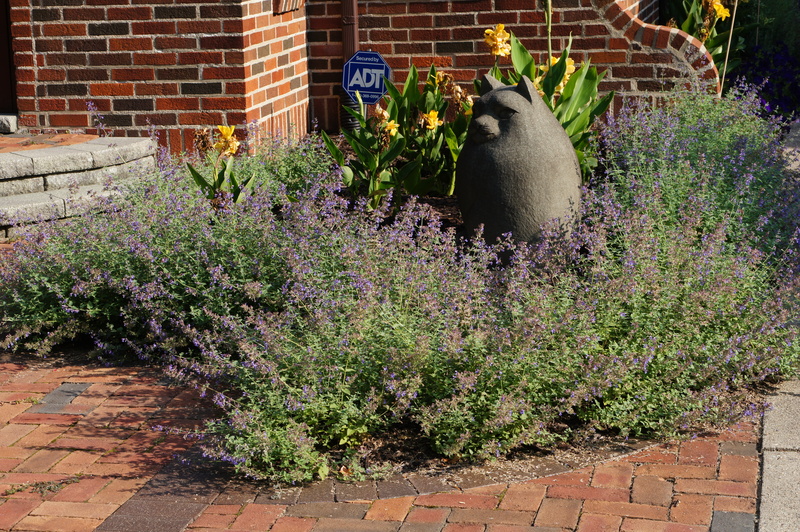 Walker’s Low Catmint newly planted in the entrance garden. 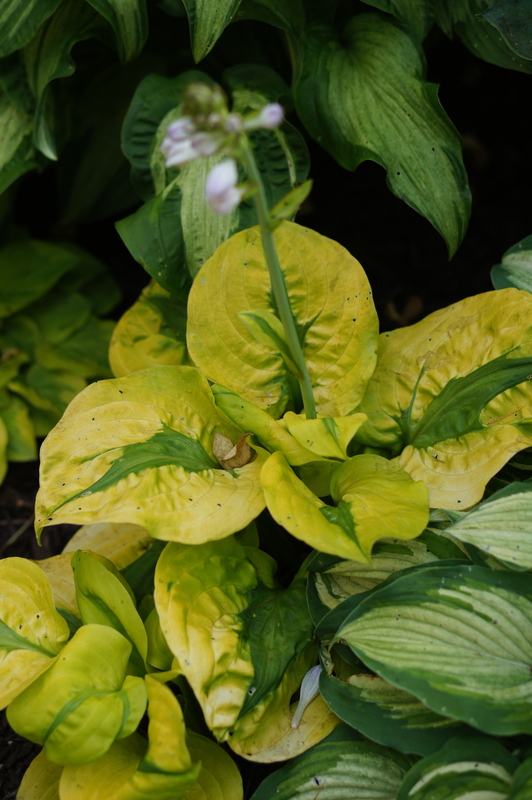 Those are yellow cannas behind it. 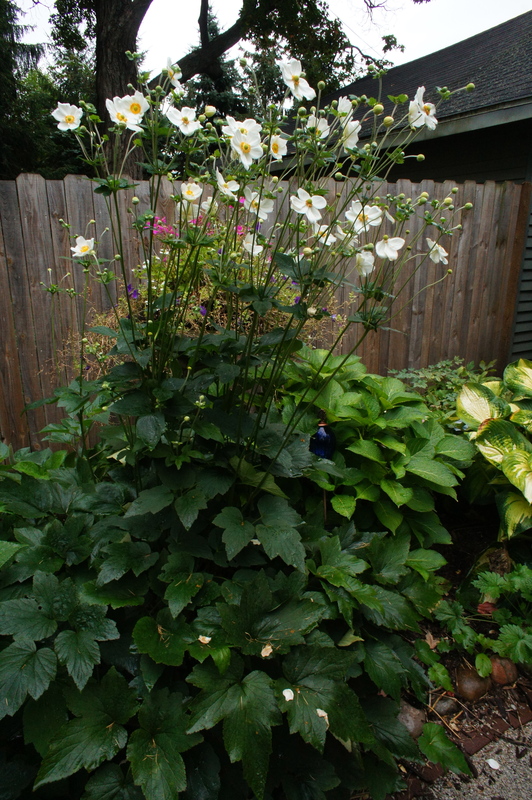 Perennial geranium that, even when propped up by a frame, gets leggy and flops. Hansa Rose in the Secret Garden with Crazy Daisy Shastas just starting to open. 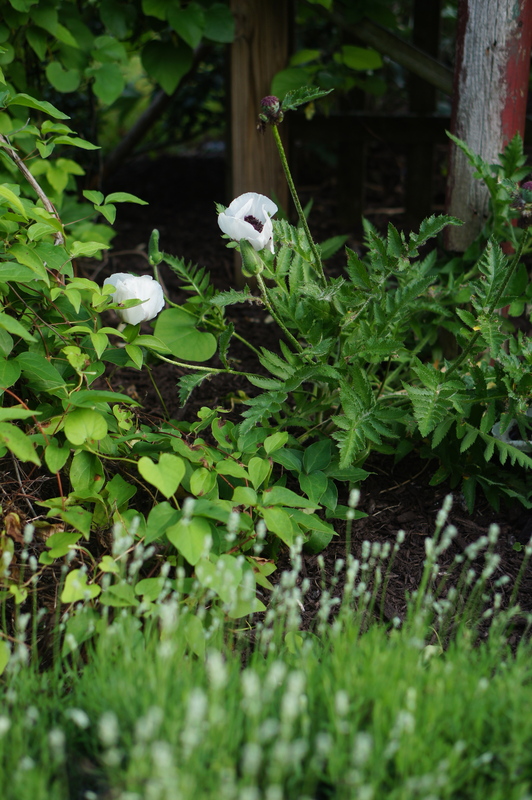 East Friesland Slavia and Rose Campion given to me by a neighbor several years ago. 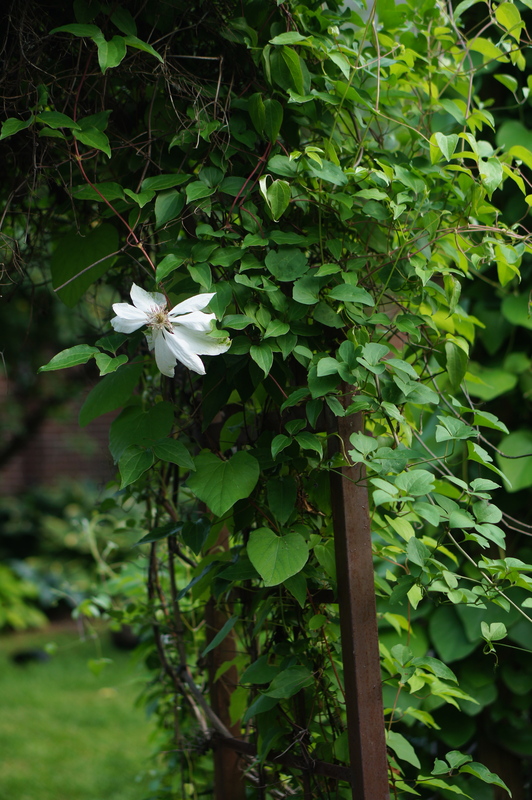 A single white clematis flowering on the arbor. The little bed near the back door. 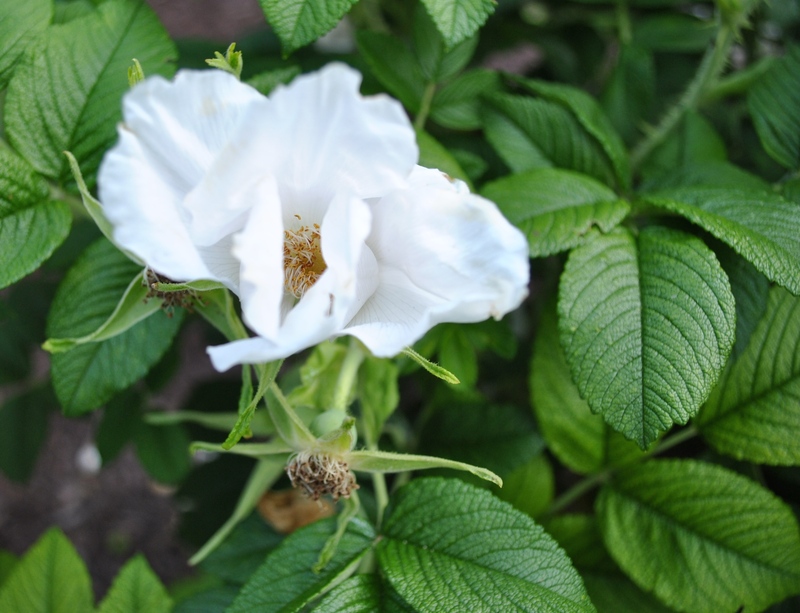 The nameless white rambling rose came from a neighbor a number of years ago.